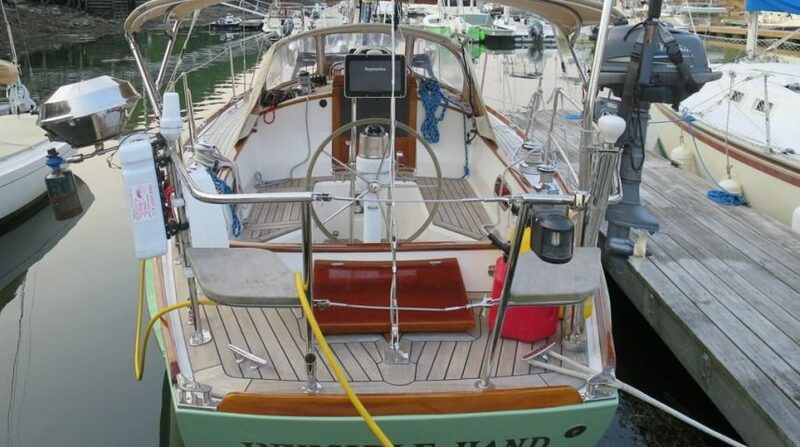 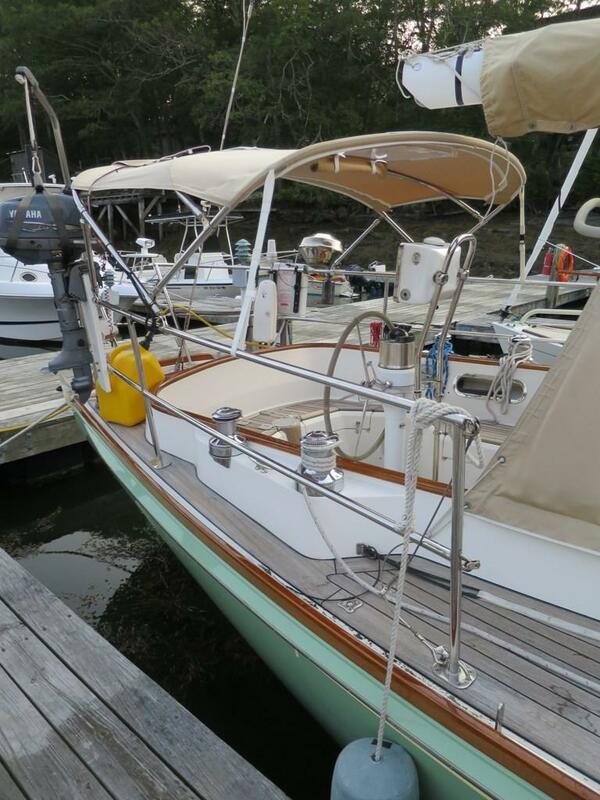 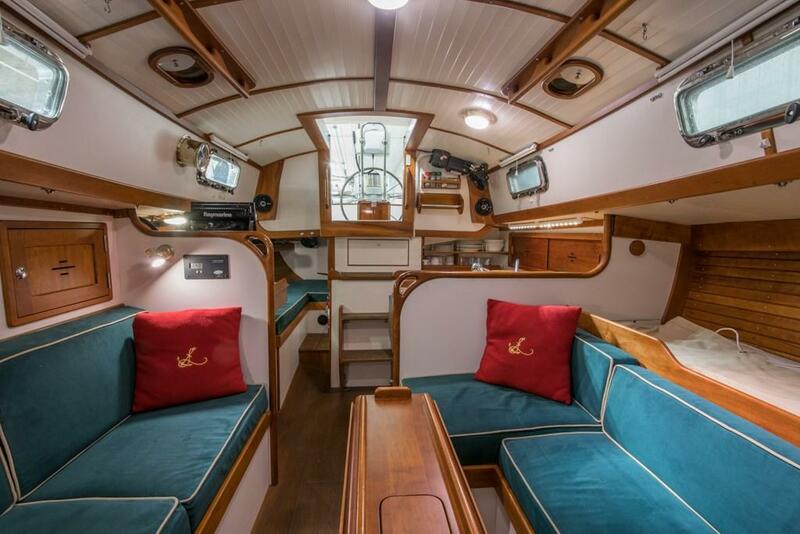 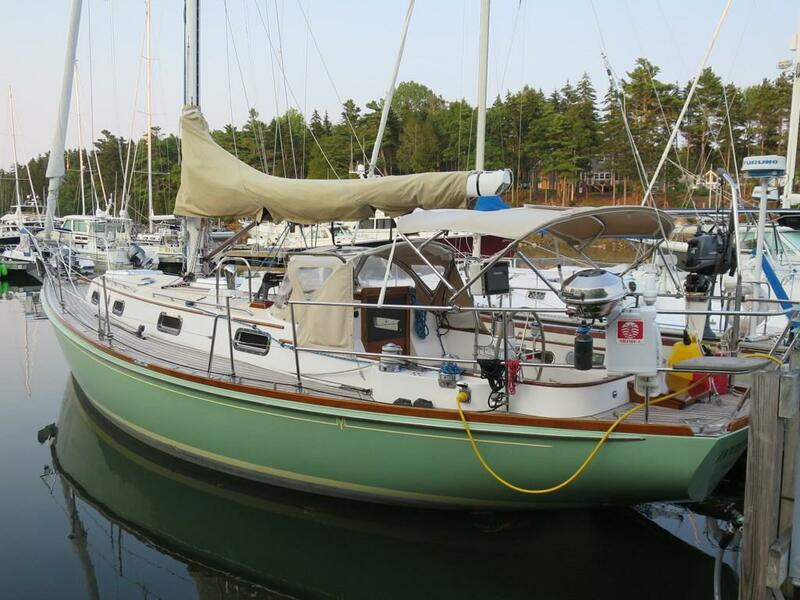 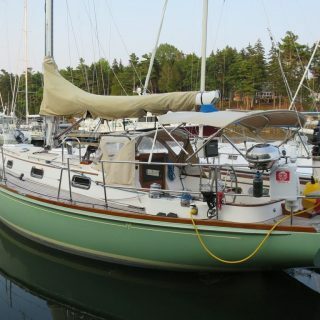 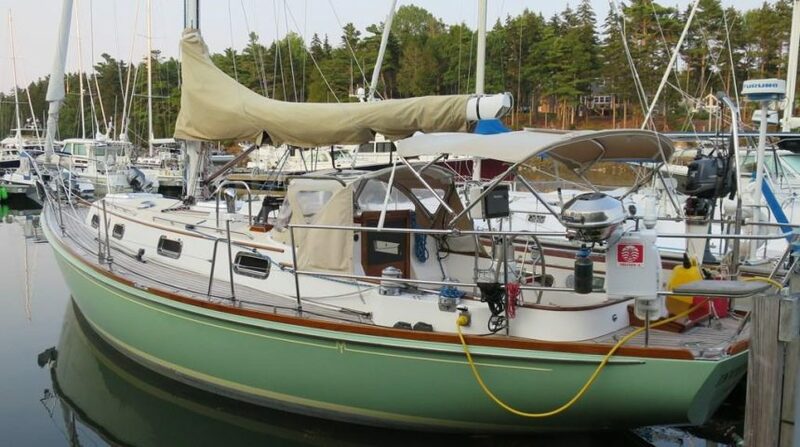 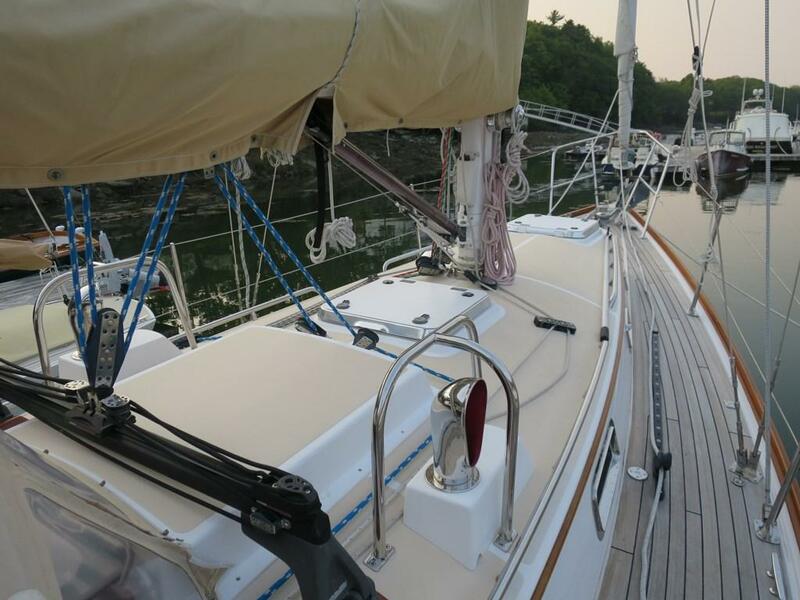 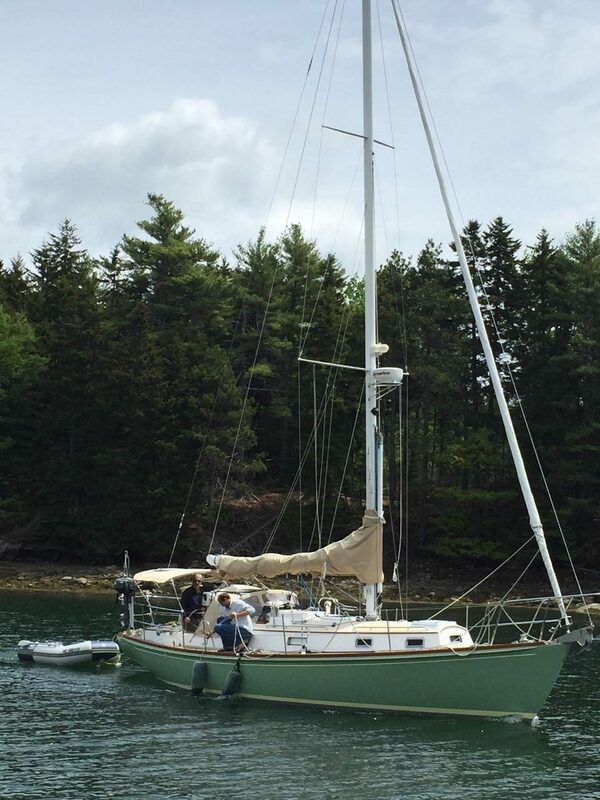 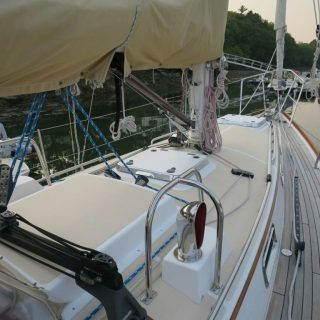 INVISIBLE HAND is one of the last Morris Ocean Series 34’s built and has been sailed summers in New England and maintained in excellent condition. 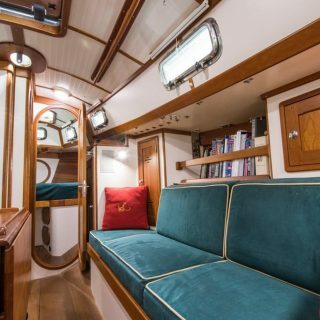 The 34 received not only the award for the best mid-sized cruiser when she was first introduced but was also unanimously voted the best overall cruising boat of the year. 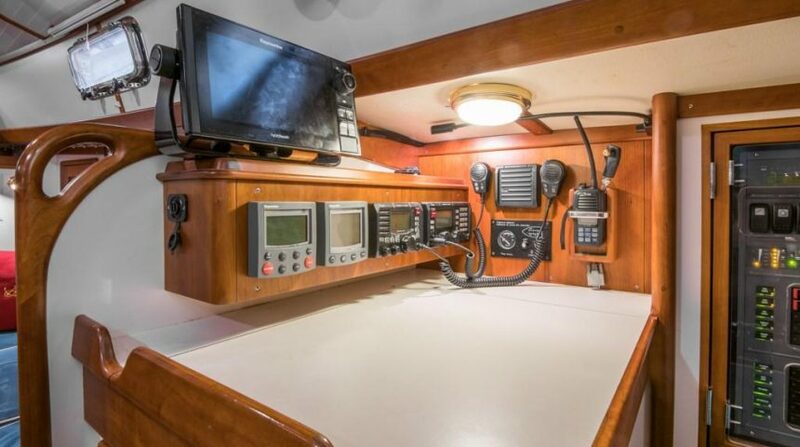 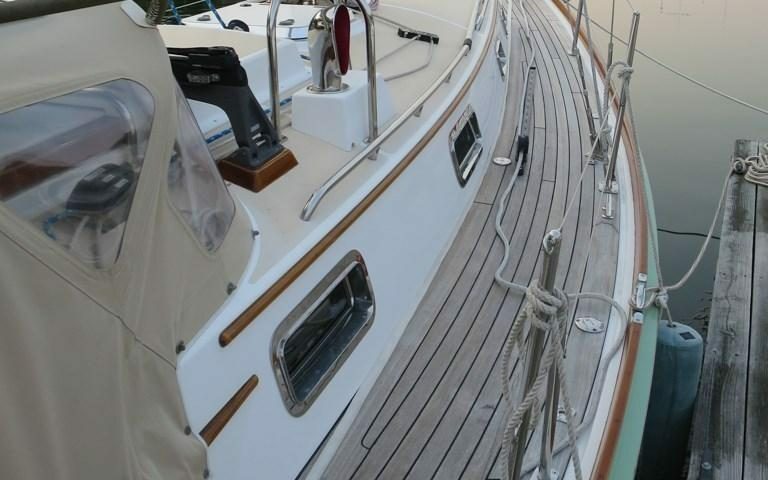 An ideal cruising boat for a couple, she is designed and built for safe and rewarding sailing and finished to a level of quality not often seen in today’s cruising boats. 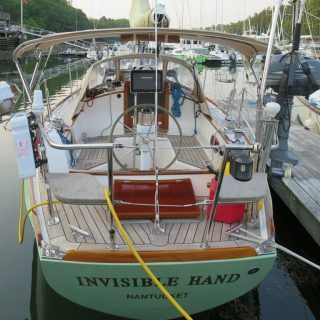 INVISIBLE HAND incorporates the best of the design and adds thoughtful and functional options by an experienced sailor. 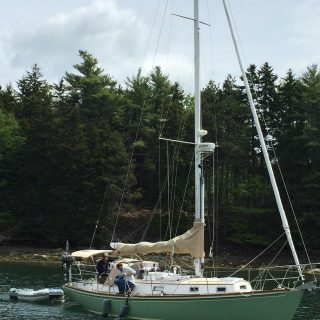 A carbon fiber mast and a sail plan that brings all of the control lines back to the cockpit for simple single handed sailing makes her a joy to sail. 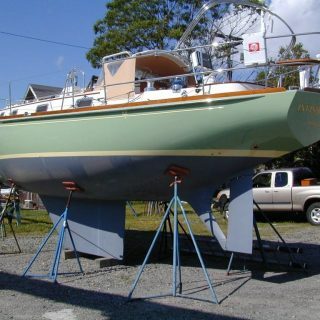 Just finishing up her winter work, she will be ready to go for the season and to bring smiles to her new owners on their first sail on her. 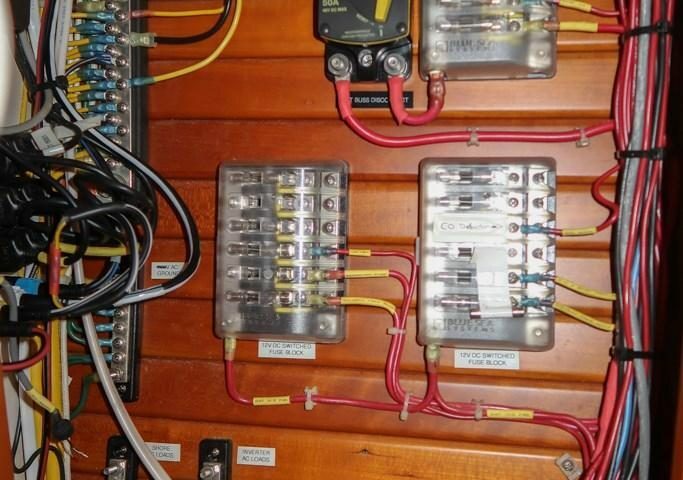 Standard core material is closed cell foam. 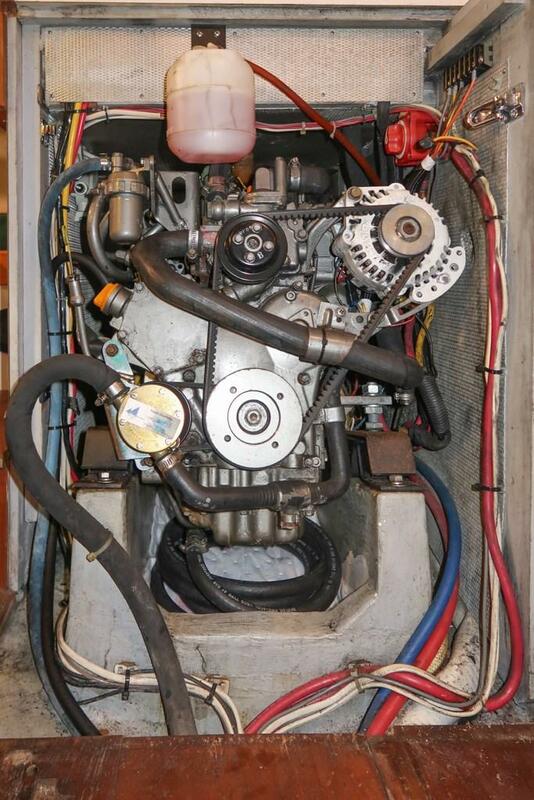 Core is replaced by high-density foam or deleted where fasteners are required. 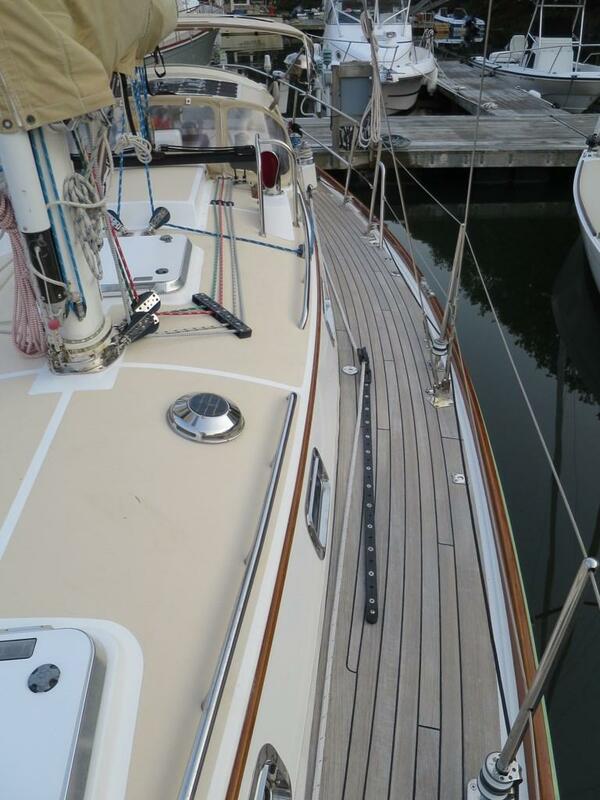 Deck is thru-bolted and glued to a wide hull flange. 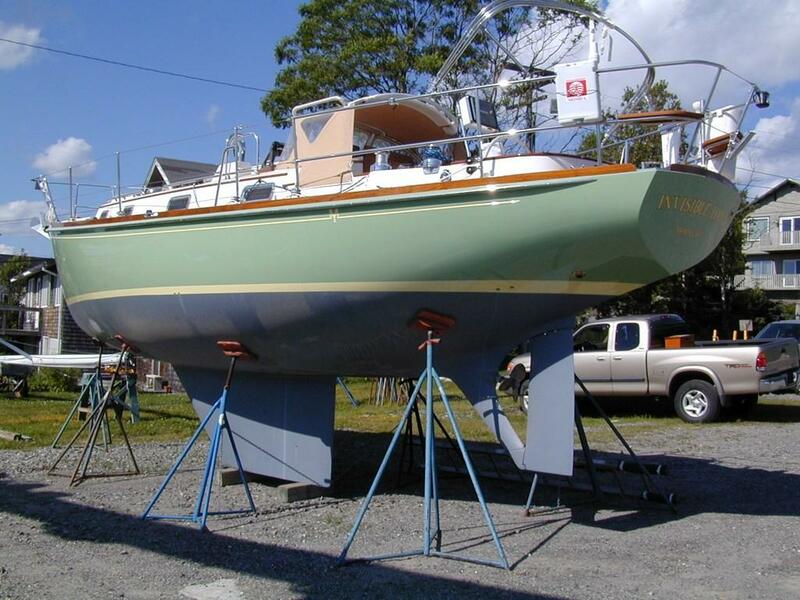 All structural bulkheads are marine grade plywood. 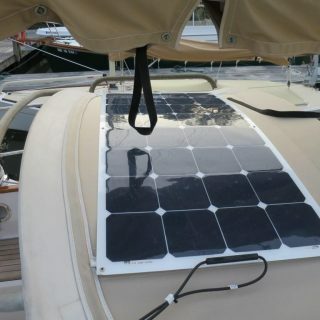 External lead ballast is bedded in 3M 5200 and thru-bolted with nine ¾” SS bolts. 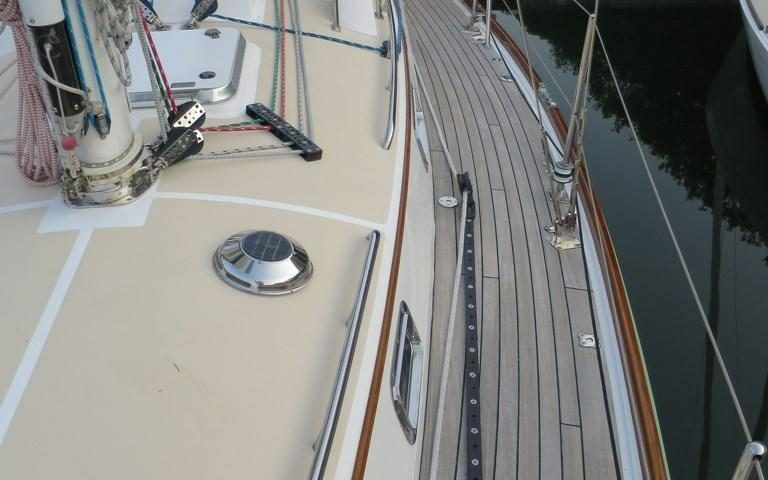 Recessed cove stripe below PVC rub rail with SS half oval chafe strip. 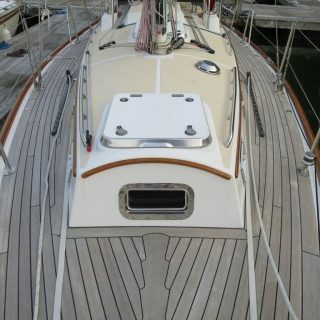 Teak decking on the cockpit seats, hatches, sole, and side decks. 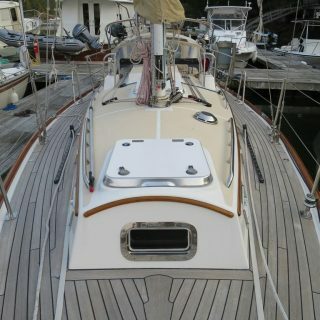 Varnished coaming caps, eyebrows, and toe rails. 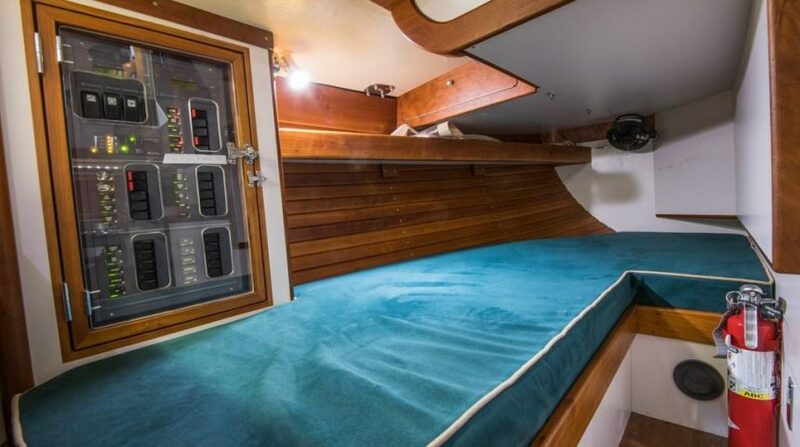 Teak hatch to the propane locker mounted aft of the cockpit. 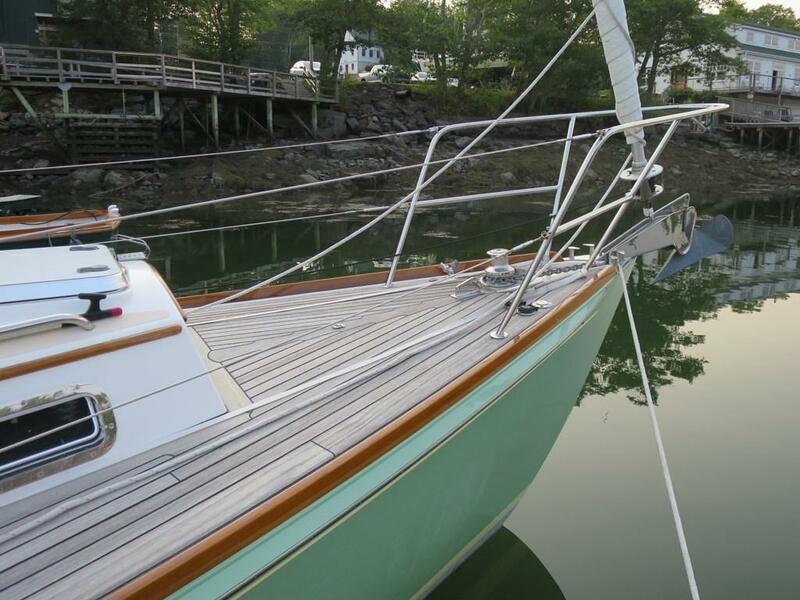 (2) Fiberglass dorade boxes with SS cowl vents, screens, and Morris Yachts closures. 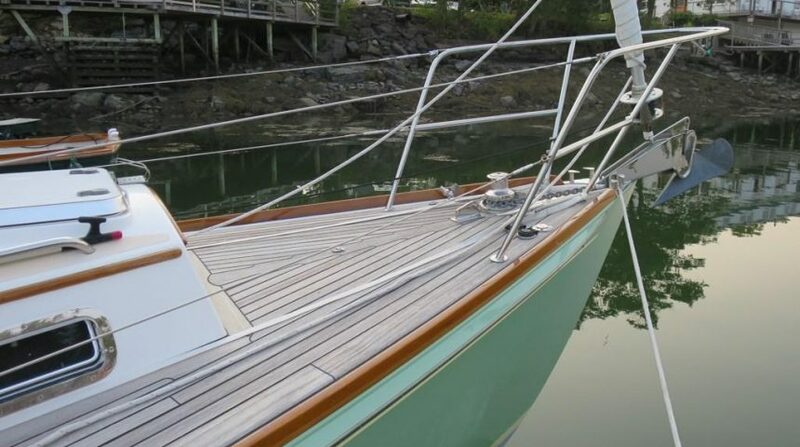 Custom bow and stern pulpits with stanchions, double lifelines and gates port and starboard. 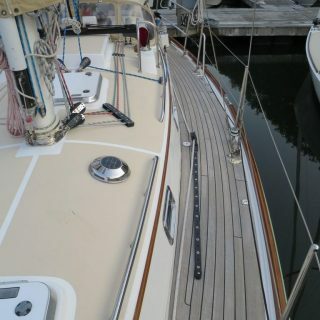 (2) Teak corner seats mounted mid rail at stern pulpit. 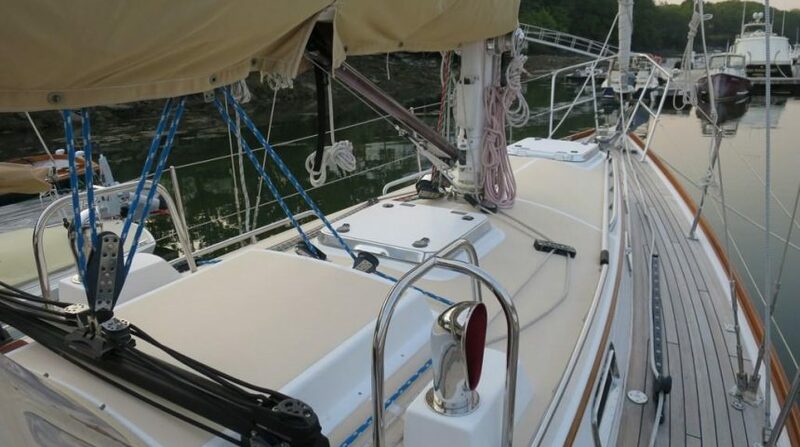 SS flag staff socket and SS rod holder mounted to stern rail. 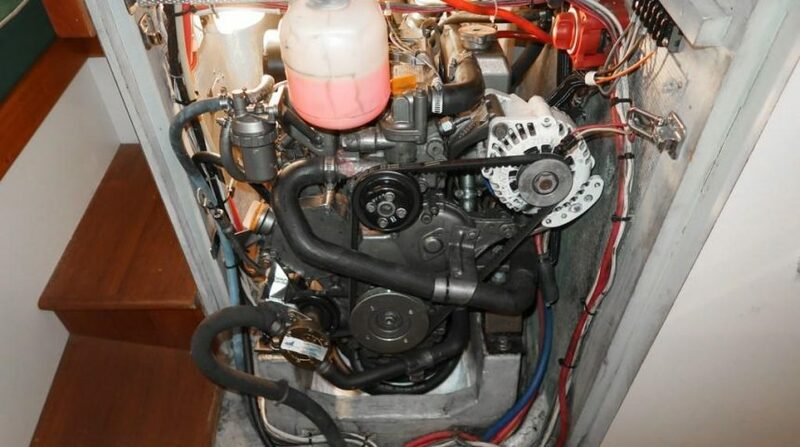 Edson motor mount fitted to starboard side of stern rail. 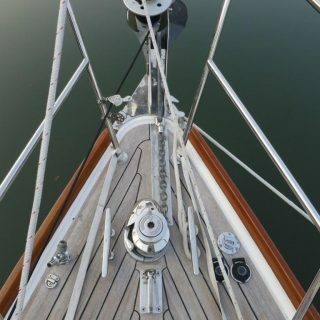 SS stem fitting with single roller to accommodate a CQR 35-lb anchor. 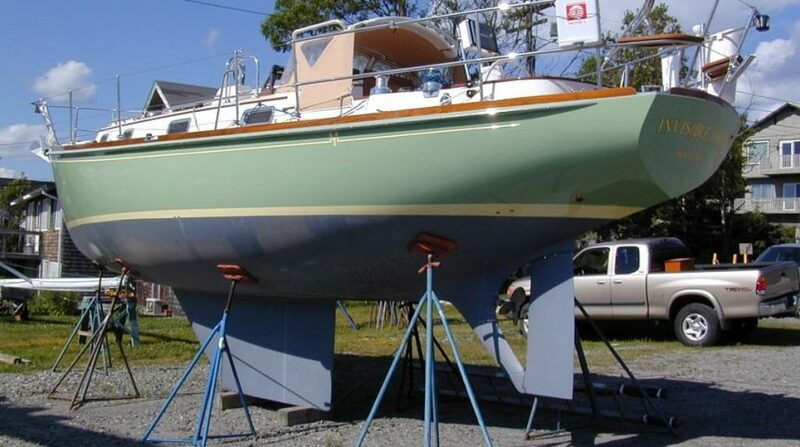 Folding deck padeyes for jacklines. 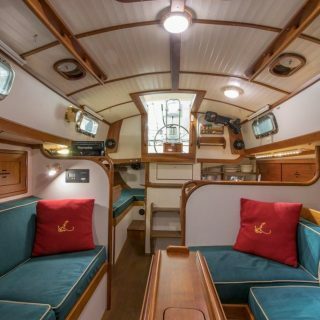 (2) Lewmar 60 cabin top hatches with smoke-colored lenses and removable screens provide lighting and ventilation to the forward and main cabins. 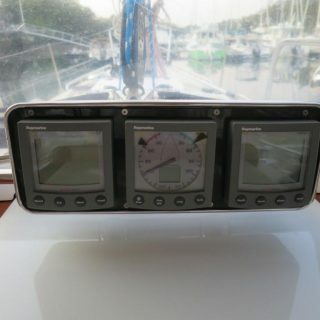 (9) Hood SS opening portlights, four large and five small. 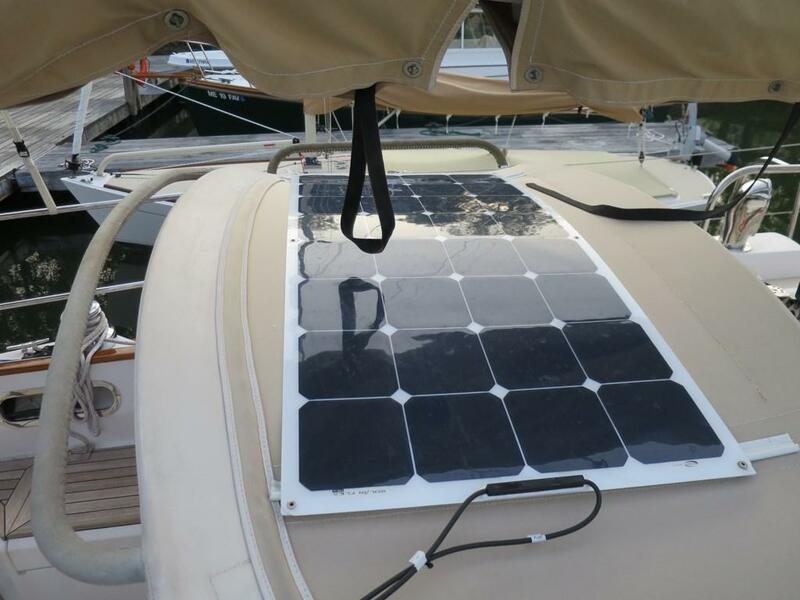 Marinco day/night solar vent for head. 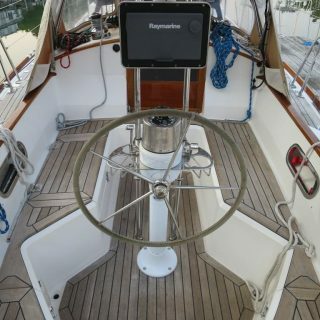 Large T-shaped cockpit with ergonomically angled coamings and cabin back. 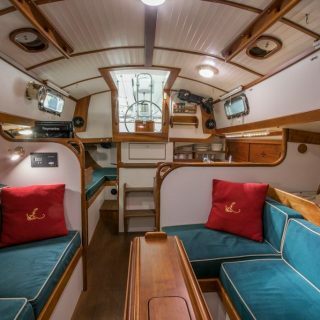 Canvas dodger with roll up front window, large side windows and cover fitted to folding SS bows. 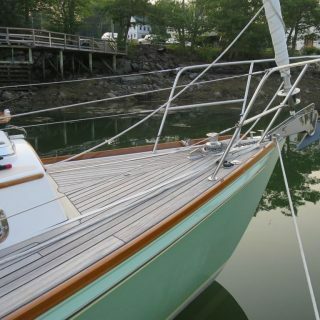 The aft bow has welded SS grab rail with an elkhide cover. 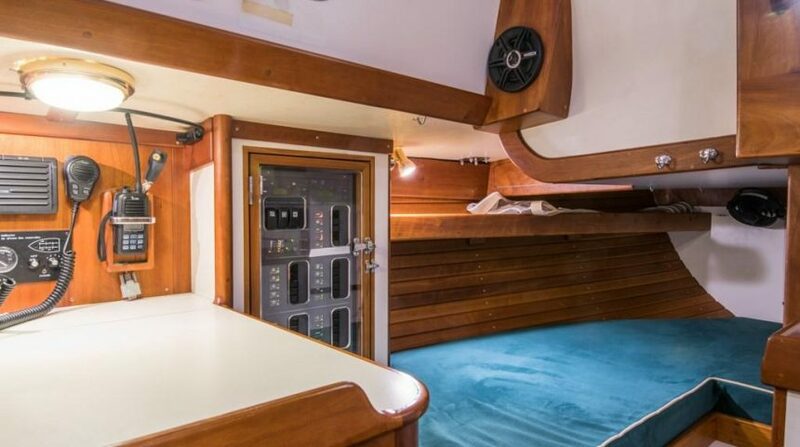 All windows are Strataglass. 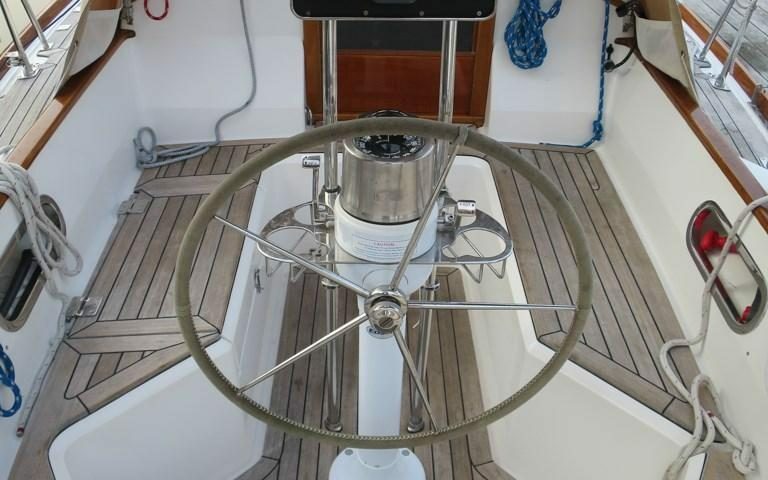 Edson CDi steering pedestal with 30” SS destroyer wheel with removable wheel hub and storage post on the stern rail. 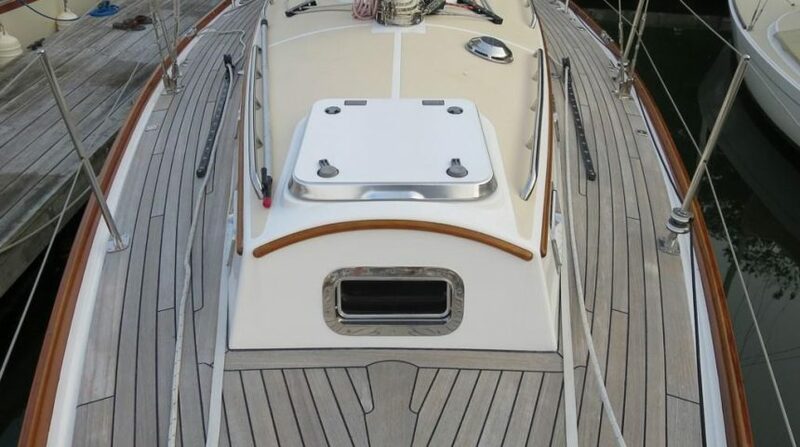 Varnished cockpit table with two leaves mounted to with an Edson folding bracket to the pedestal guard. 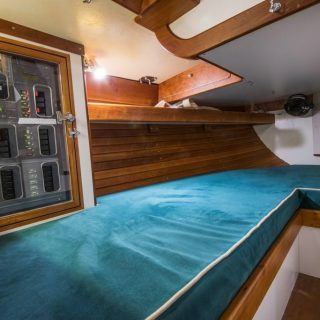 Varnished teak companionway drop boards with storage bag. 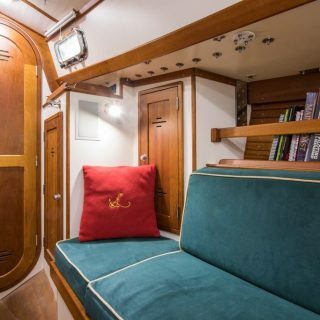 Cockpit cushions in “Oyster” Sunbrella fabric with “Forest Green” piping. 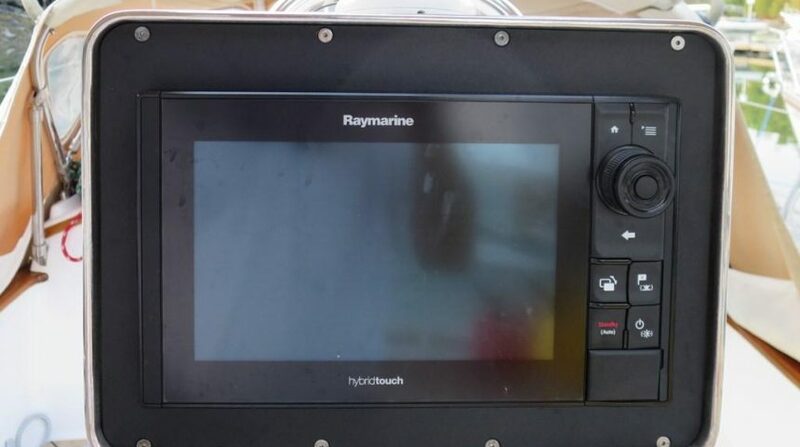 Magma propane kettle grill mounted on port side of stern rail. 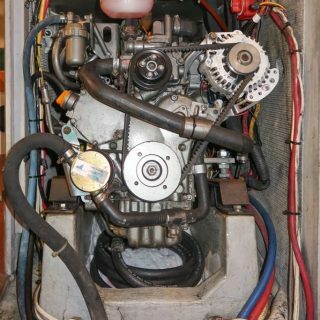 Grill uses its own individual propane bottles. 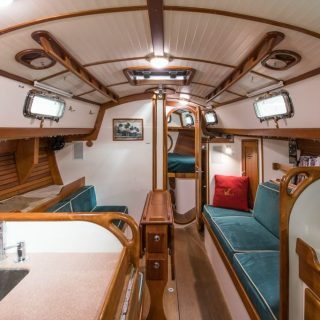 INVISIBLE HAND is finished in the traditional Herreshoff style with antique white Pionite laminate bulkheads and satin varnished cherry trim. 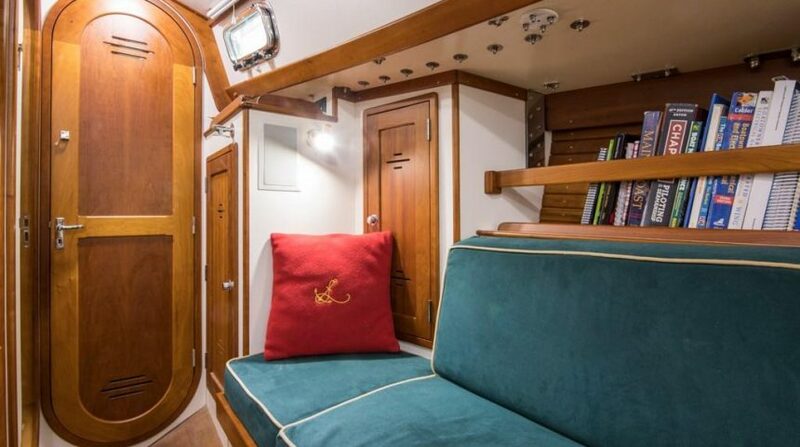 The overhead is finished in removable off-white panels with cherry trim. 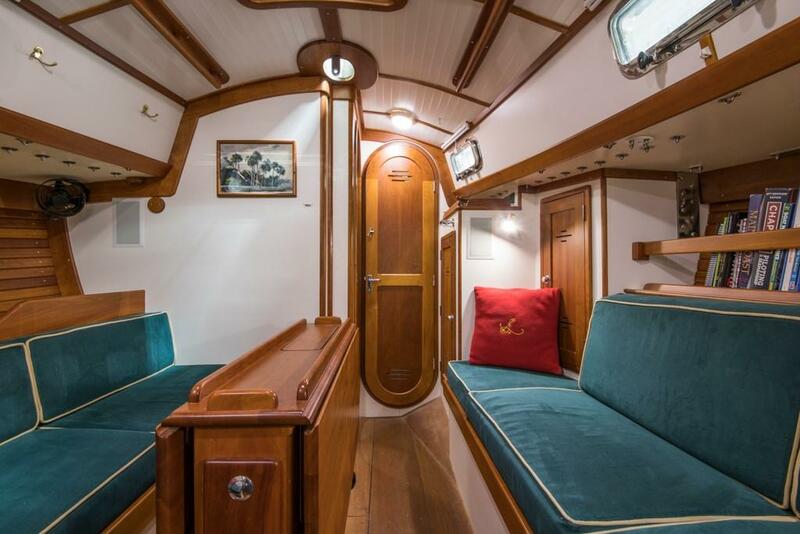 The cabin sole is a satin finished solid teak and the hull sides are finished in cherry sheathing. 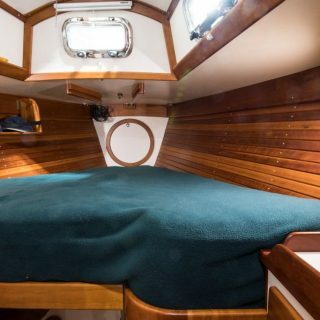 Comfortable v-berth converts to double with insert. 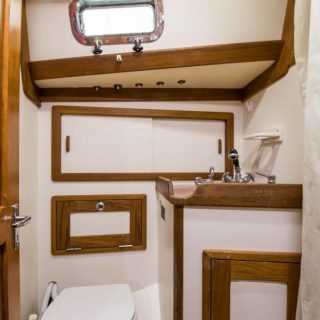 Storage below the berths in (2) trays and (2) footlockers, both accessed through drop-front lip doors. 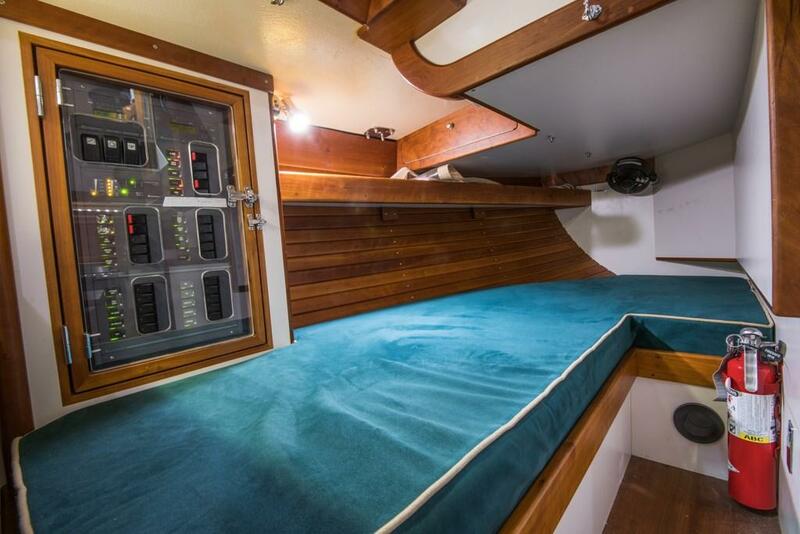 Starboard hanging locker with fiddled shelf and cork insulation on the hull. 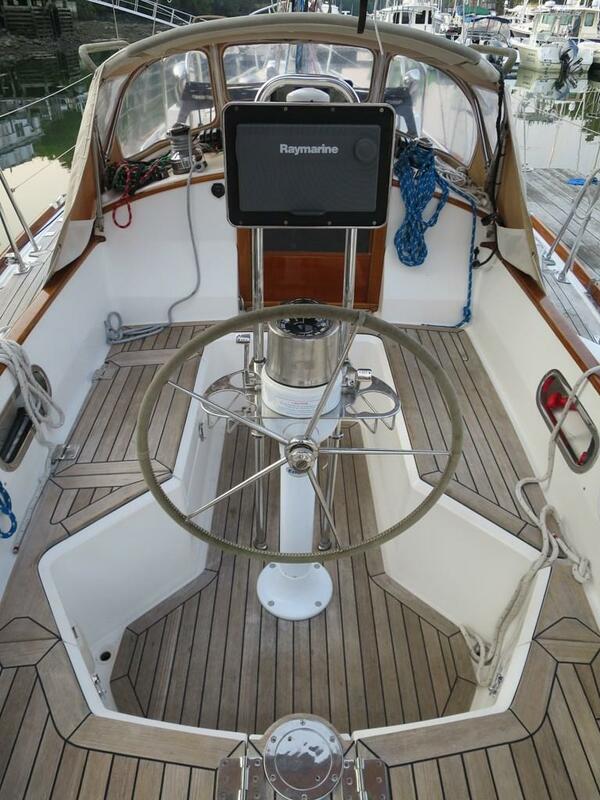 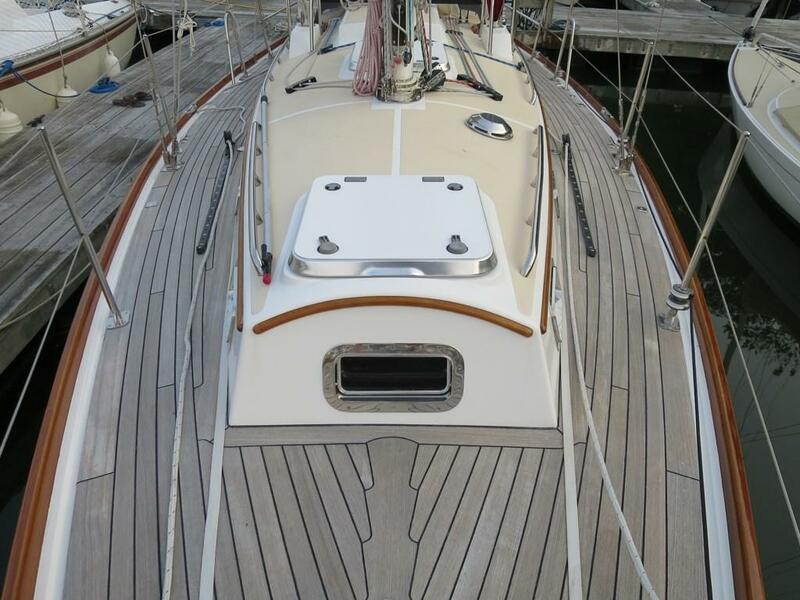 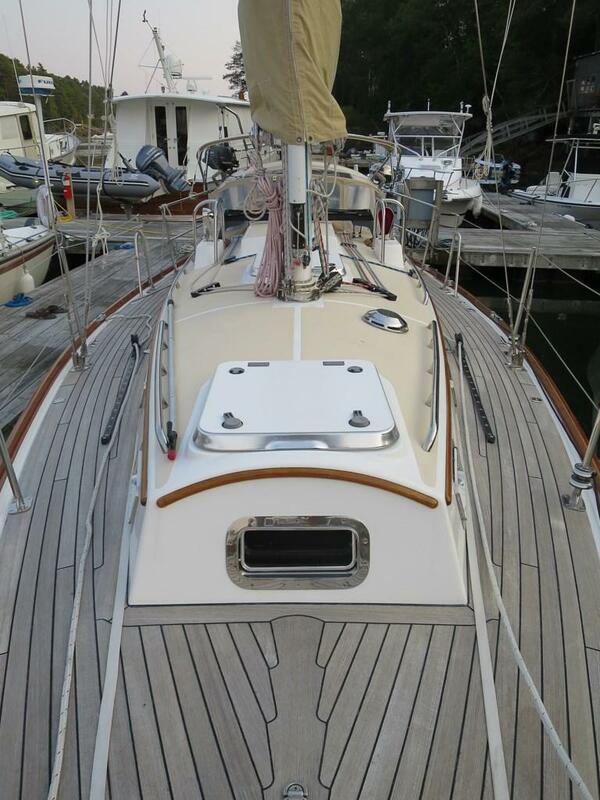 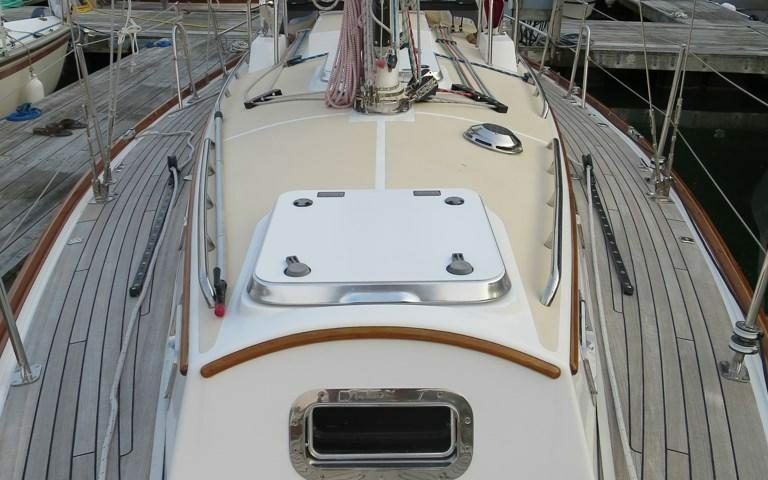 The head, located to port, has Pionite laminate bulkheads with oiled teak trim. 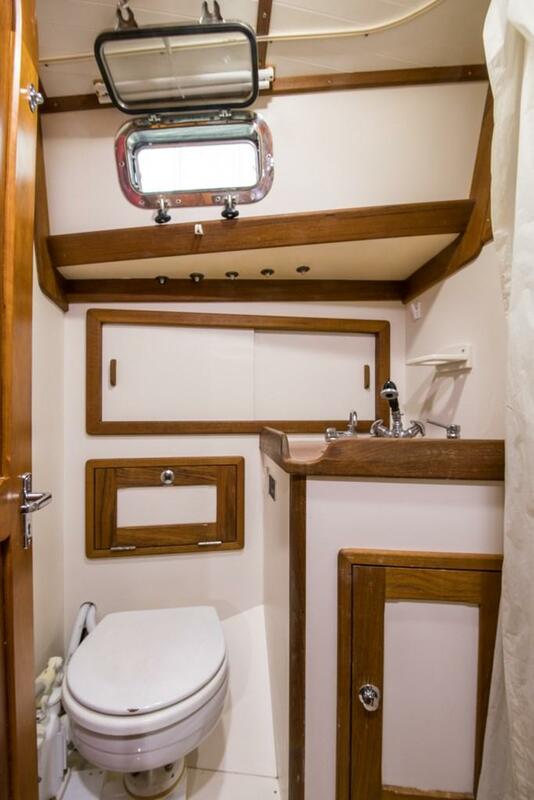 A marine toilet with cabinet is outboard, with single shelf and two sliding doors. 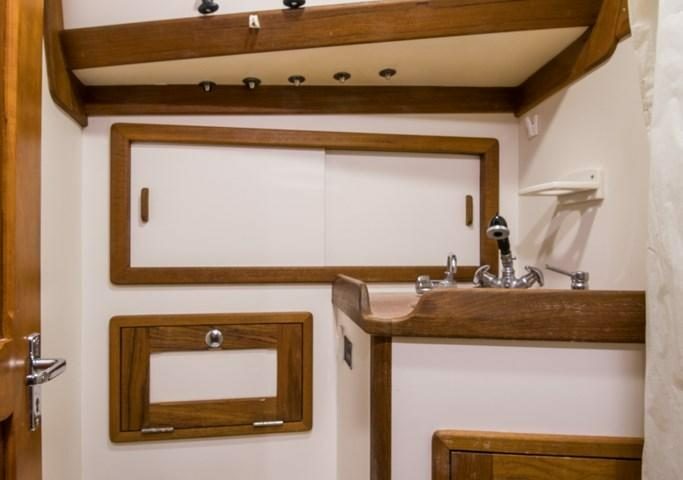 The sink cabinet has a Corian countertop, teak fiddles, and polished SS oval sink with pullout shower faucet. 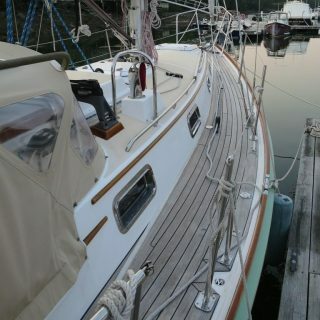 L-shaped dinette to port with backrest locker outboard and fixed pilot berth on the port side. 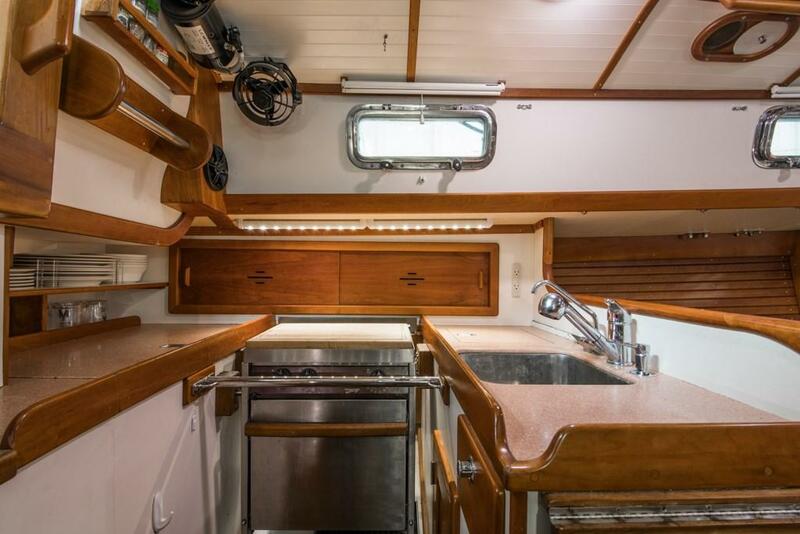 Fixed drop-leaf dining table on the center-line seats 5 comfortably. 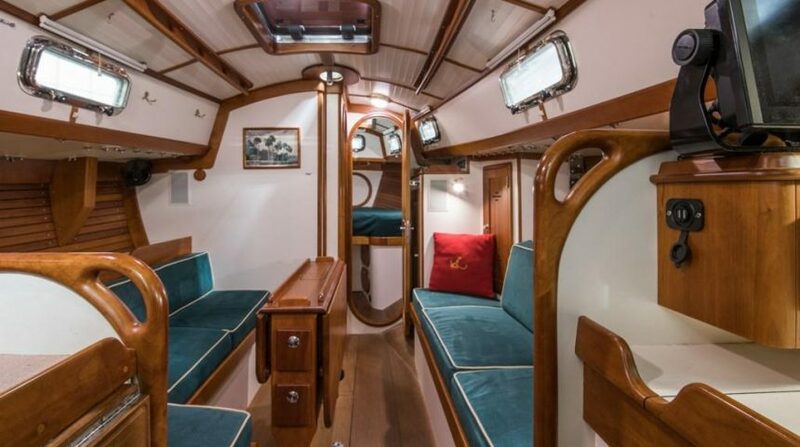 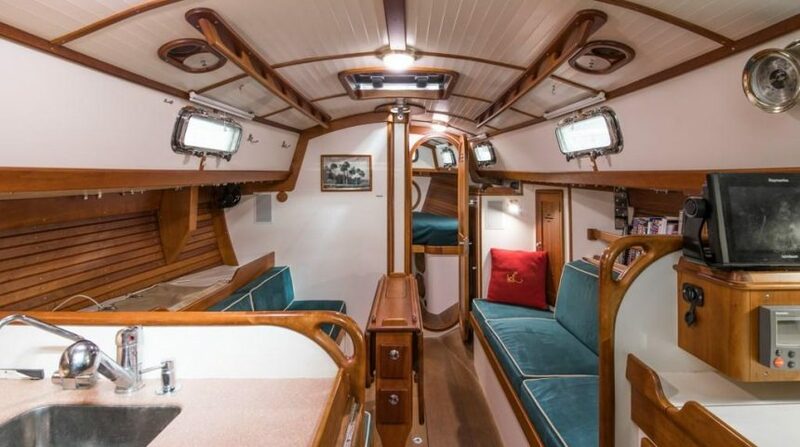 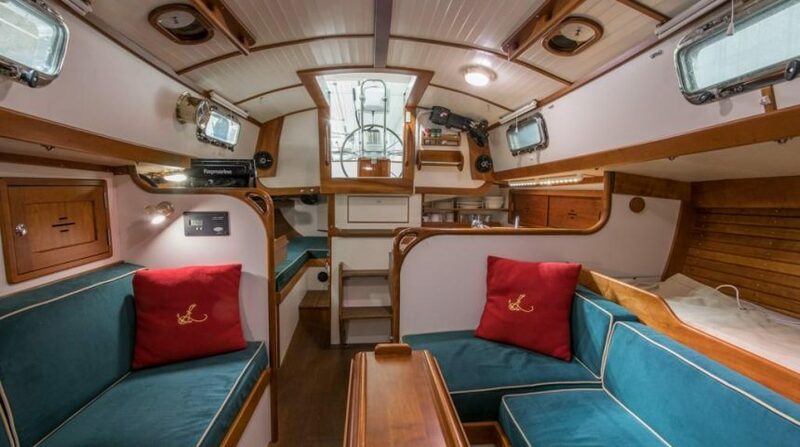 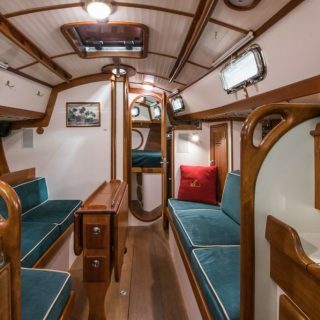 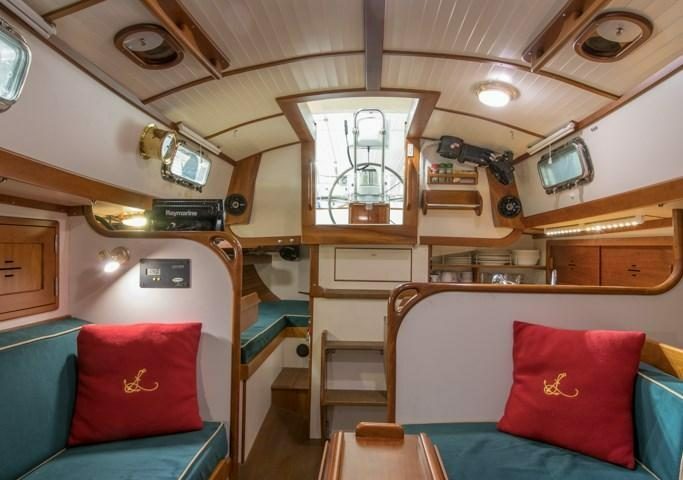 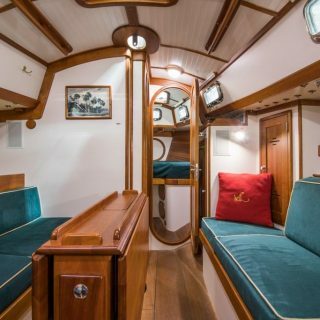 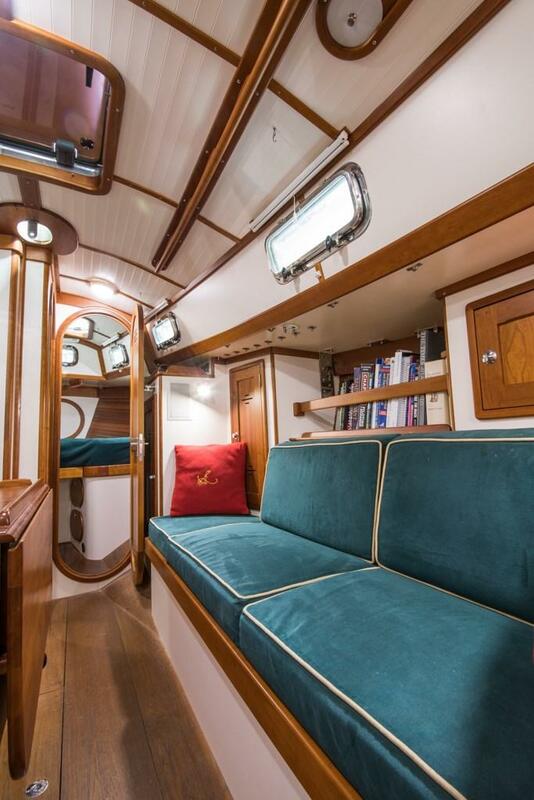 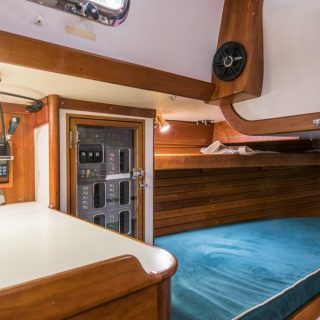 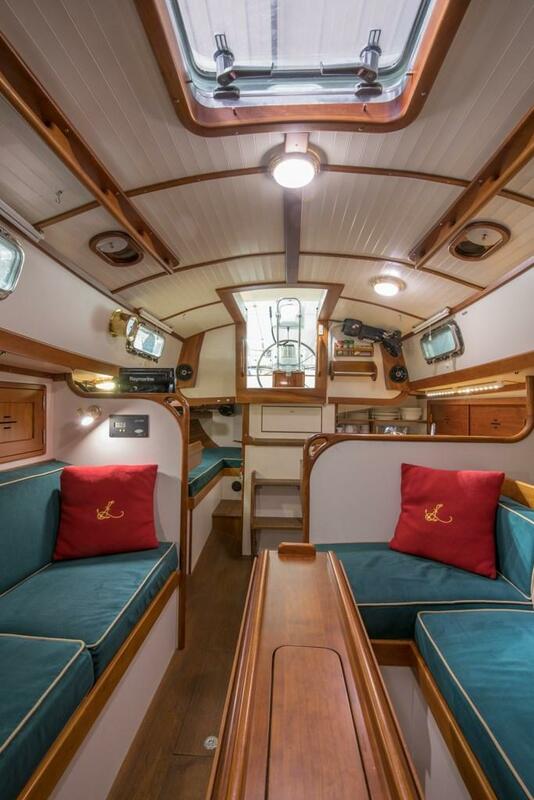 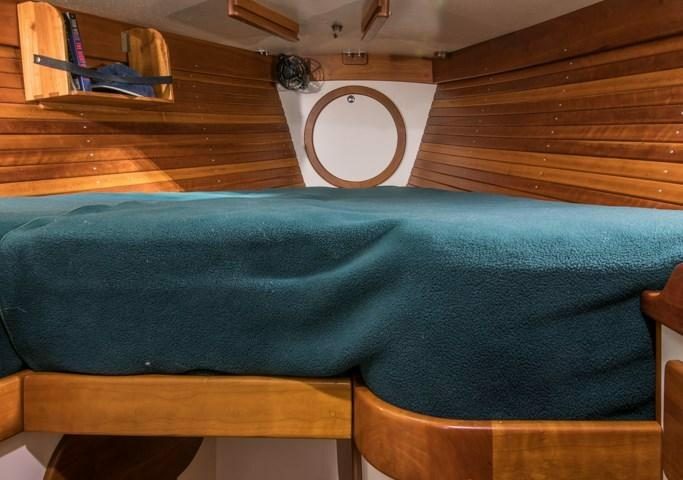 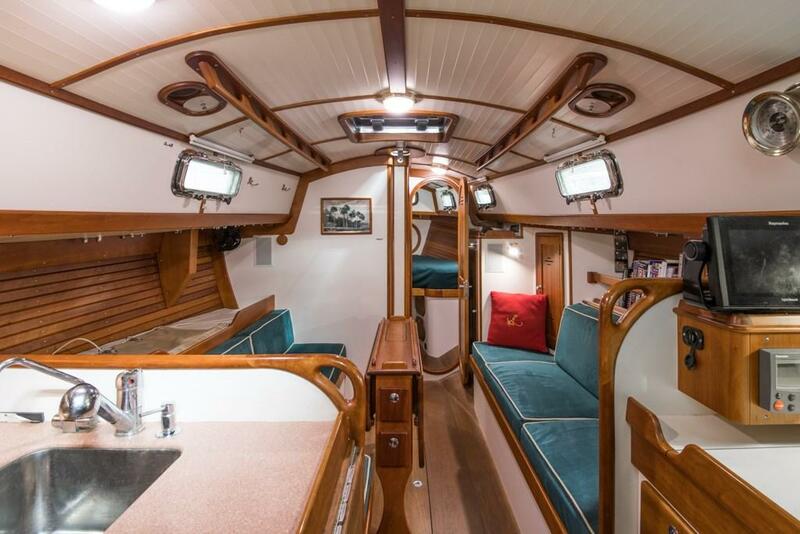 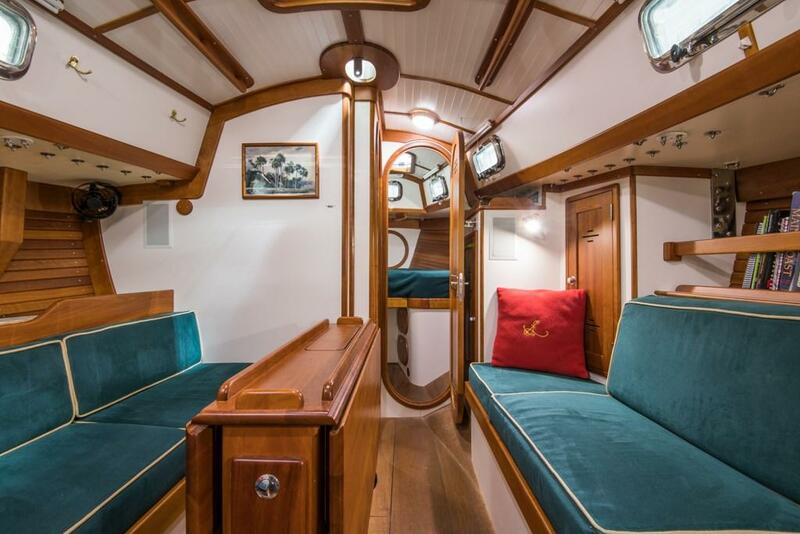 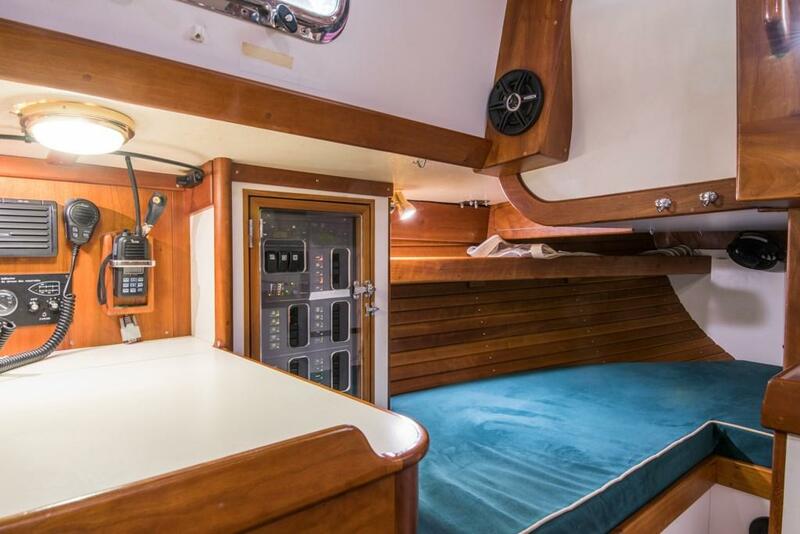 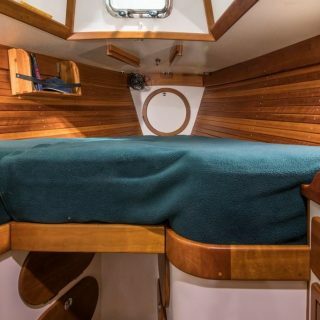 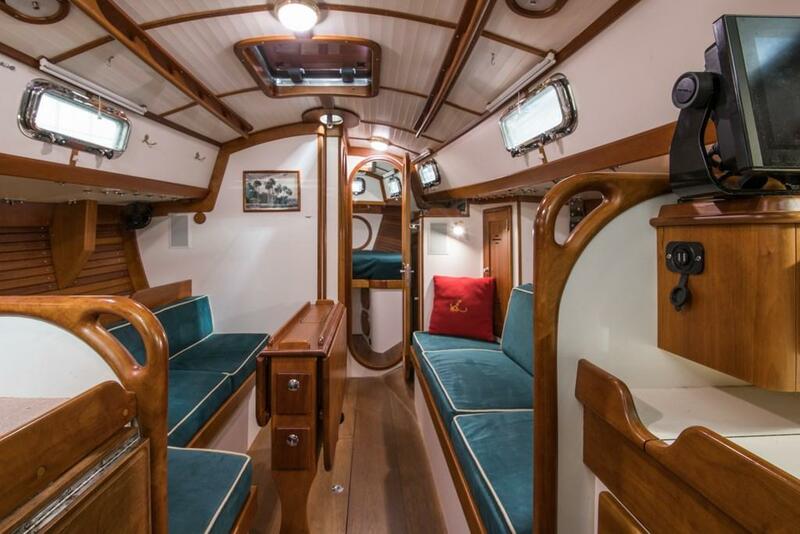 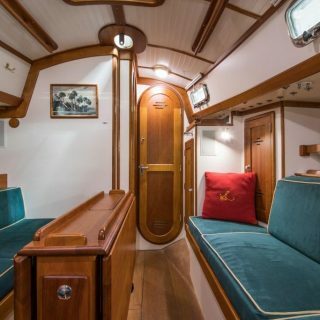 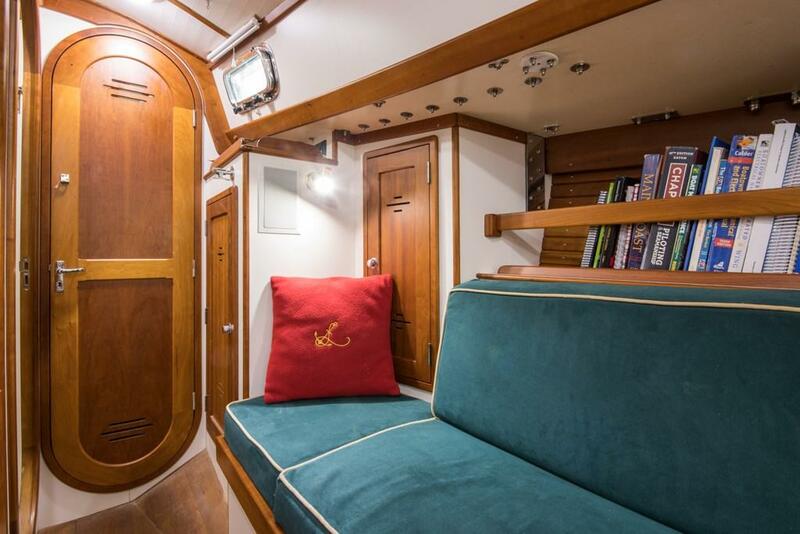 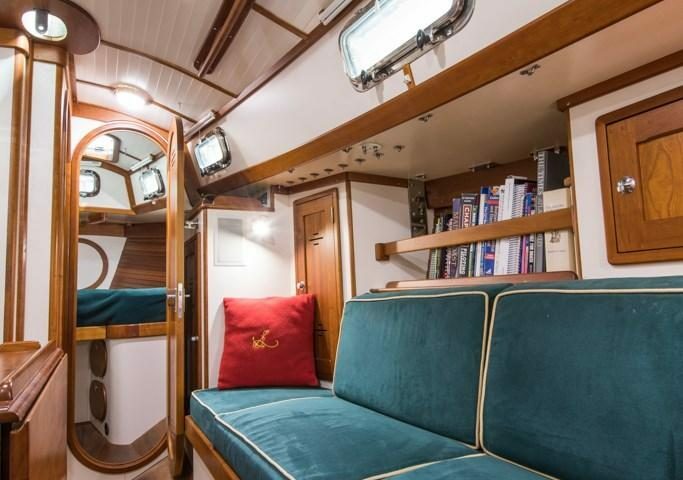 Settee to starboard pulls out six inches to make a comfortable sleeping berth with backrest locker outboard, two storage lockers above, and a bookshelf in-between. 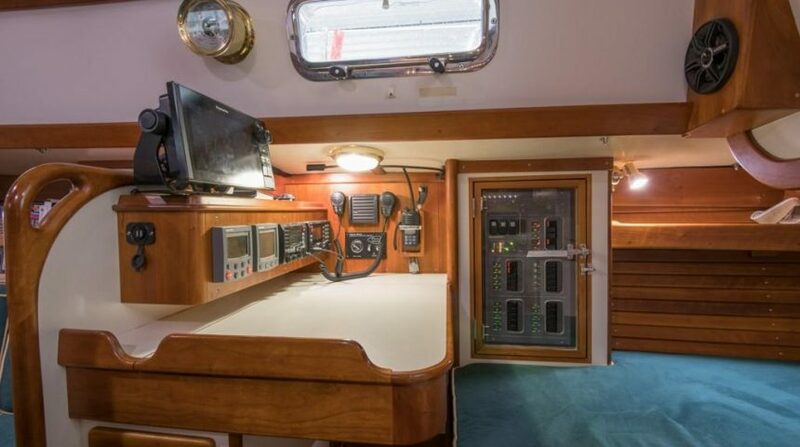 SS safe located in forward hanging locker. 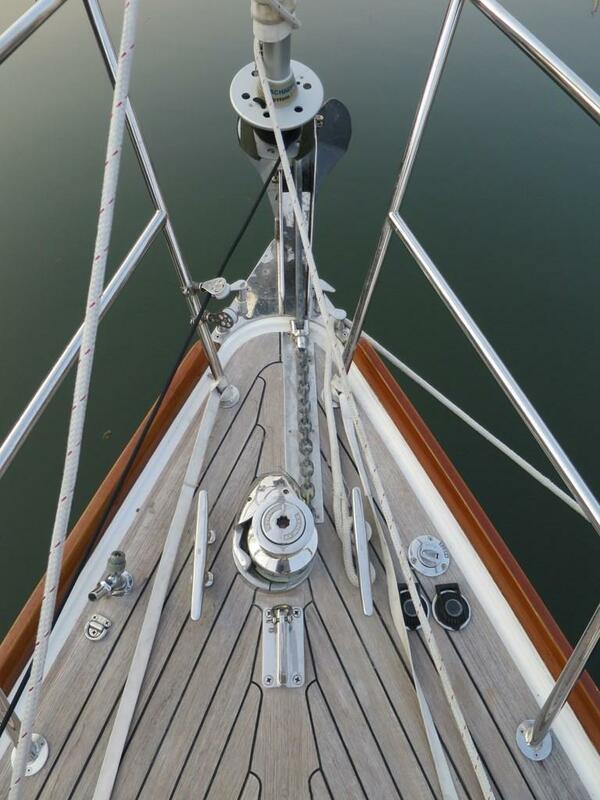 Varnished cherry handrails run the length of the main salon to provide hand holds underway. 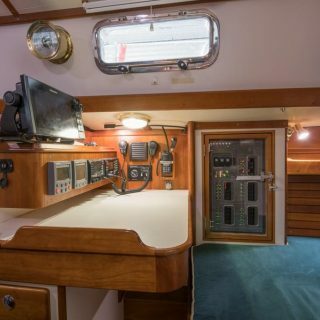 Forward facing navigation desk with opening top for chart storage and shelf space for navigation books. 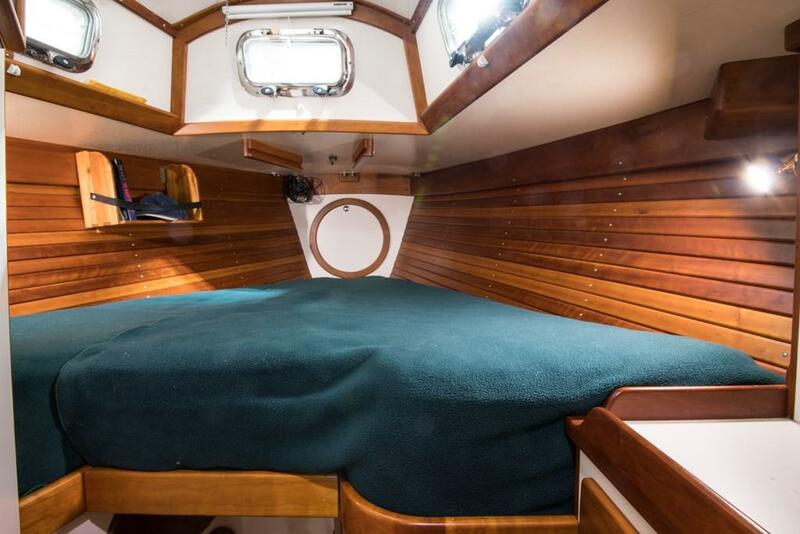 Forward end of quarter-berth serves as the seat. 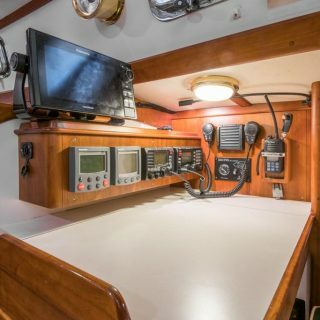 Flush mounted VHF and ST60 multi-function repeater and chart light. 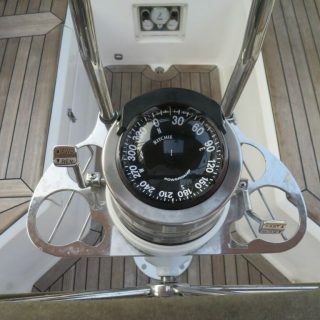 Comfortable quarterberth aft of nav station. 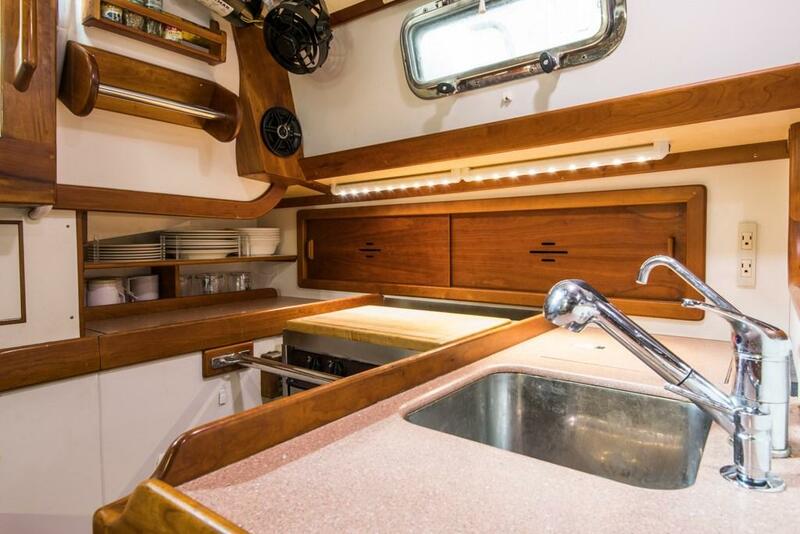 Force 10 two-burner propane stove with SS door, oven and broiler. 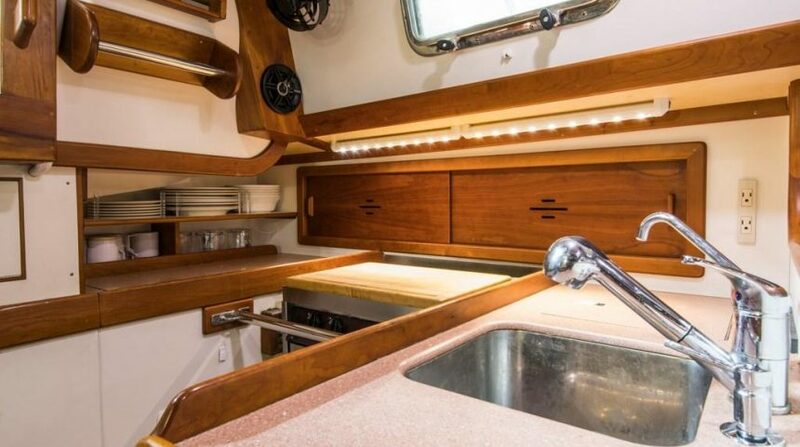 Maple cutting board that fits perfectly within the fiddles on the top of the stove. 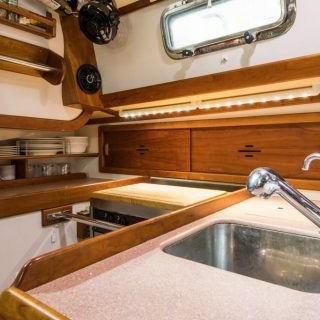 SS splatter guard that stores behind the stove and lifts up to protect the galley cabinet while cooking. 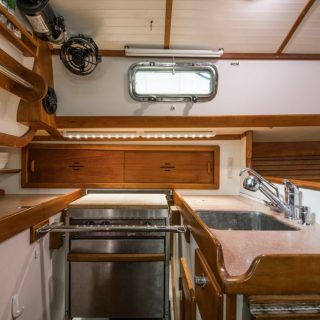 Scandvik SS mirror polished oval sink with single lever faucet and separate spray located forward of stove with counter space inboard and dry storage under counter outboard. 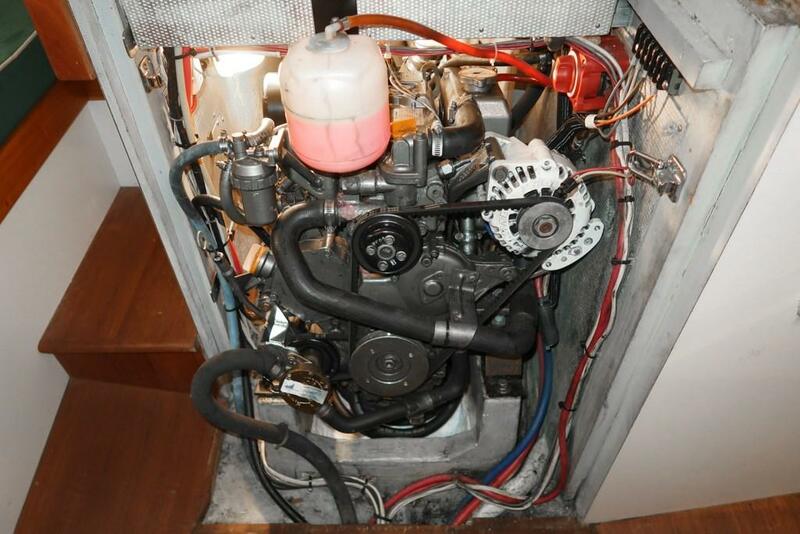 Trash bin and utility drawer located below sink. 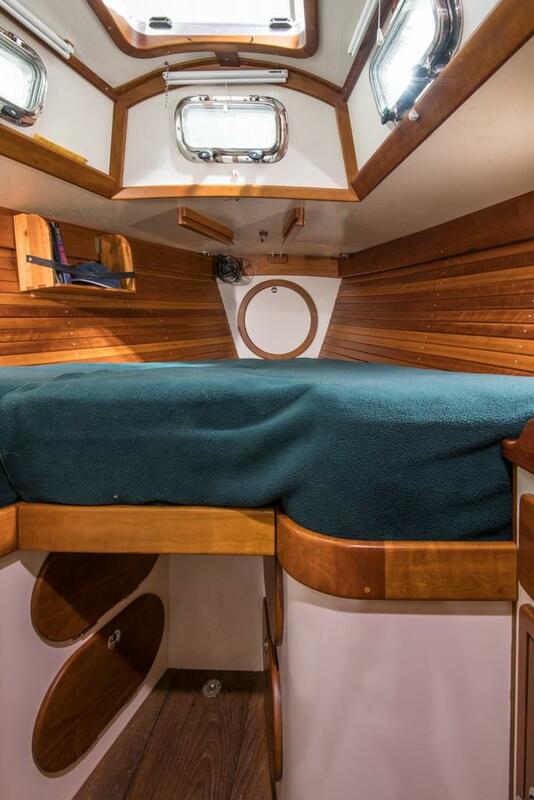 Espar D2 diesel cabin heater with outlets in the main cabin and forward cabin. 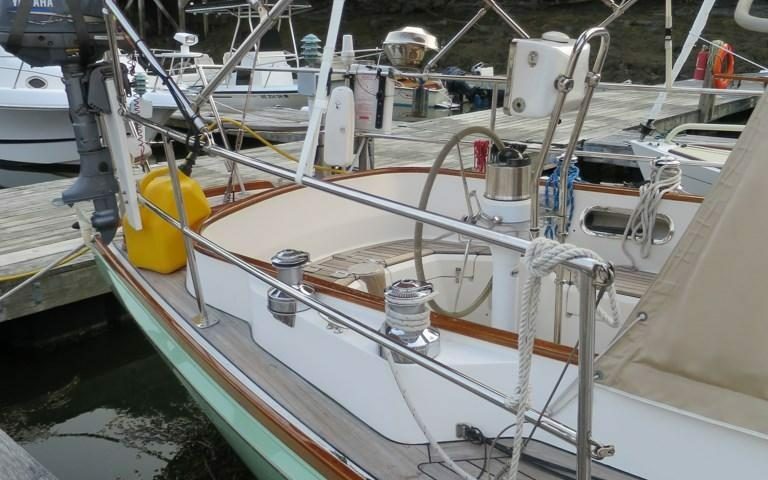 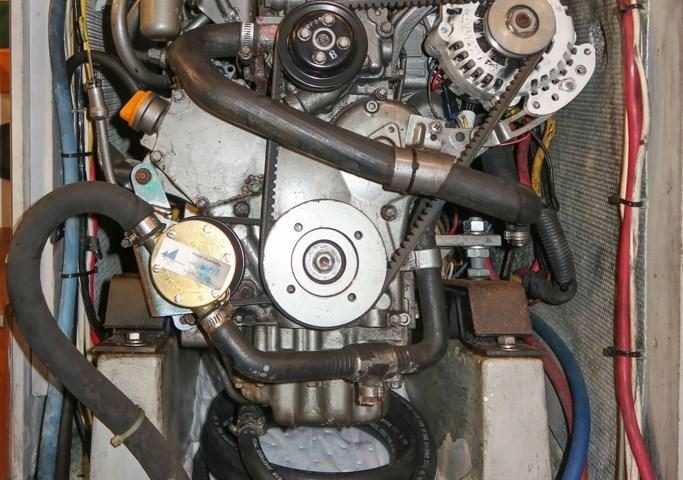 Shurflo Blaster wash pump with spigots on the foredeck and at the stern. 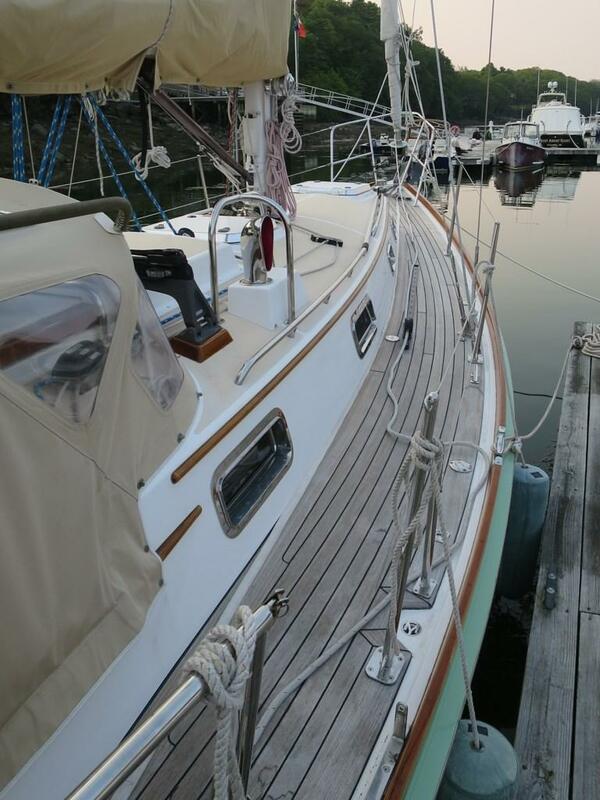 Head may be discharged overboard through a seacock and manual discharge pump or to a 15-gallon waste holding tank. 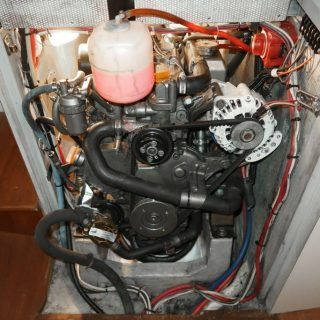 SS 6-gallon capacity water heater, heated by engine and shore power heating element. 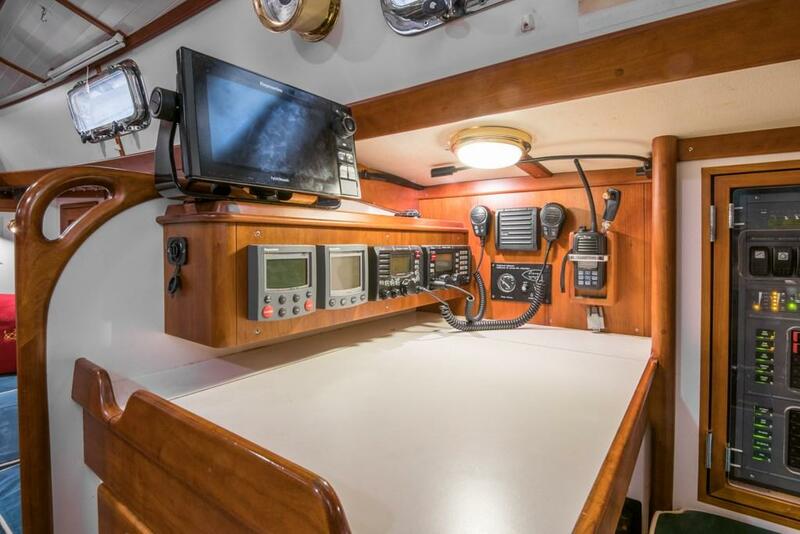 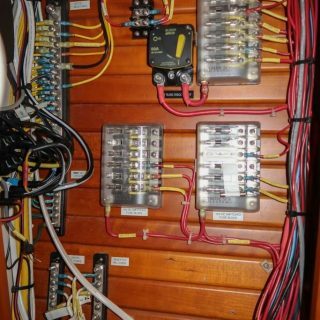 Mastervolt electrical panel with circuit breakers, voltmeter, amp meters, polarity indicator, main breakers, battery switches and bilge pump switch. 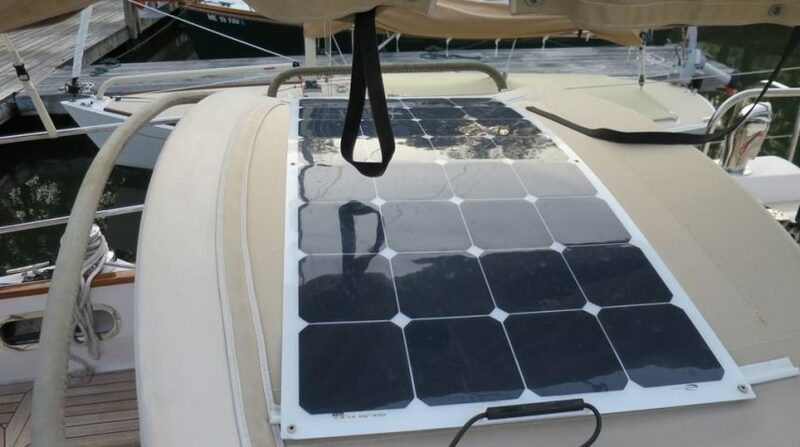 Mastervolt Mass Combi 2000 watt inverter/charger with built-in three stage battery charger. 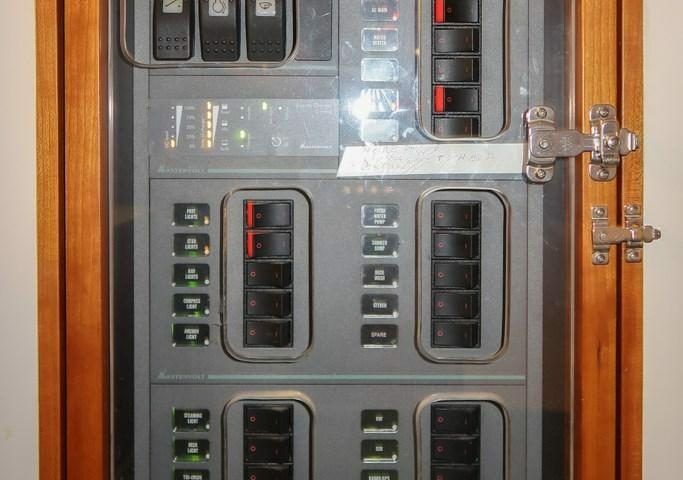 (3) Duplex outlets with GFI. 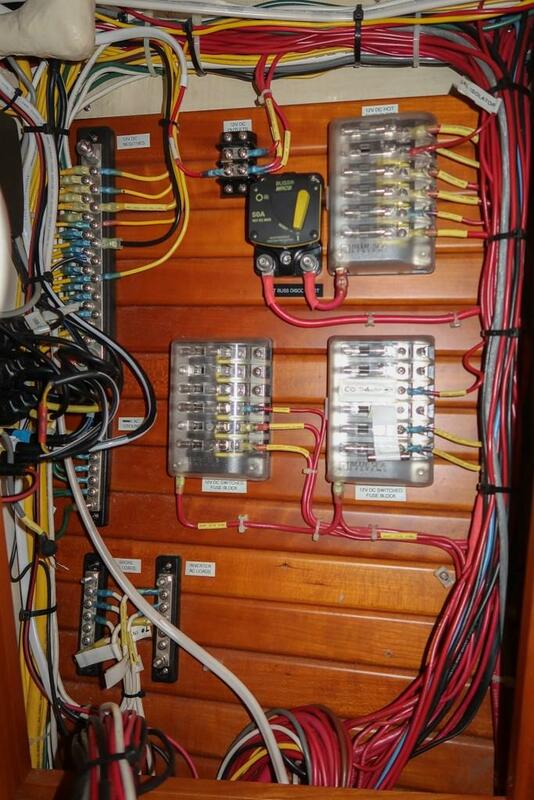 Outlets located at galley, head and main cabin. 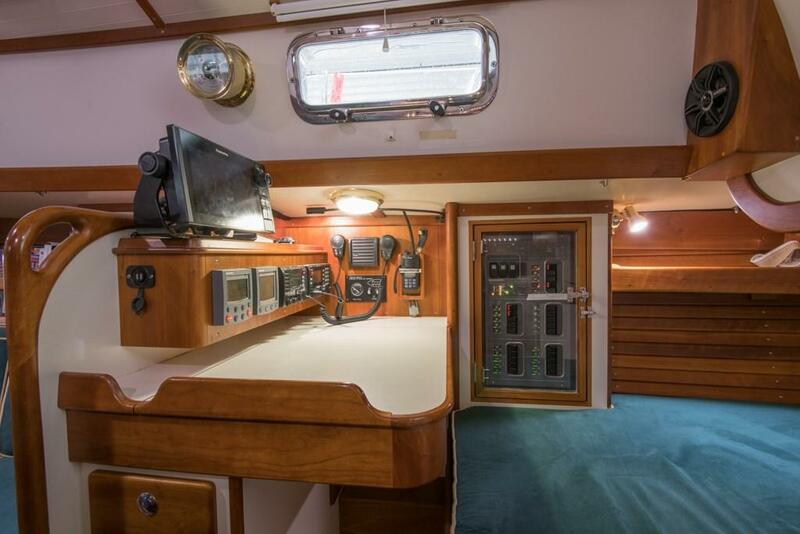 Aqua-Signal running lights on bow pulpit and stern rail. 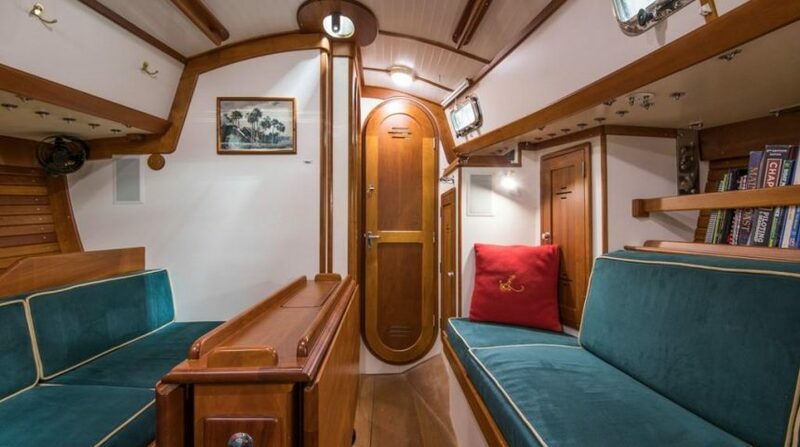 (5) Cantalupi dome lights. 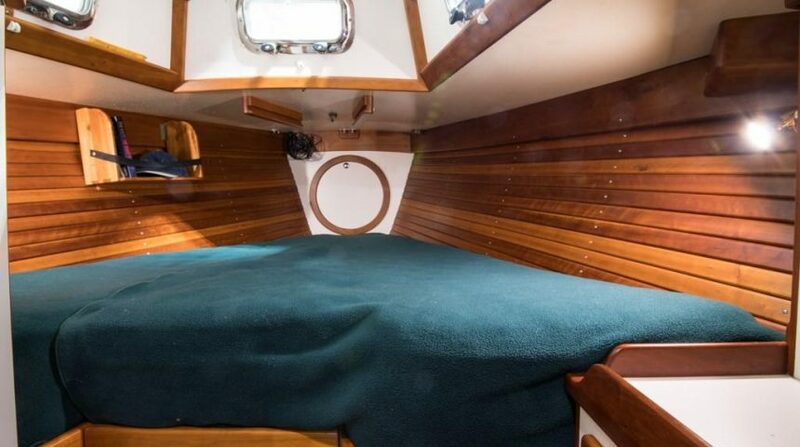 (2) in forward cabin, (1) in the head and (2) in main cabin. 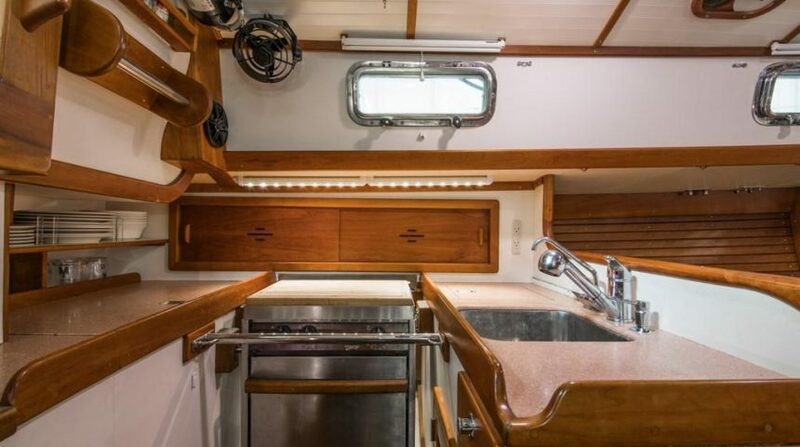 (3) Cantalupi bulkhead mounted lights. 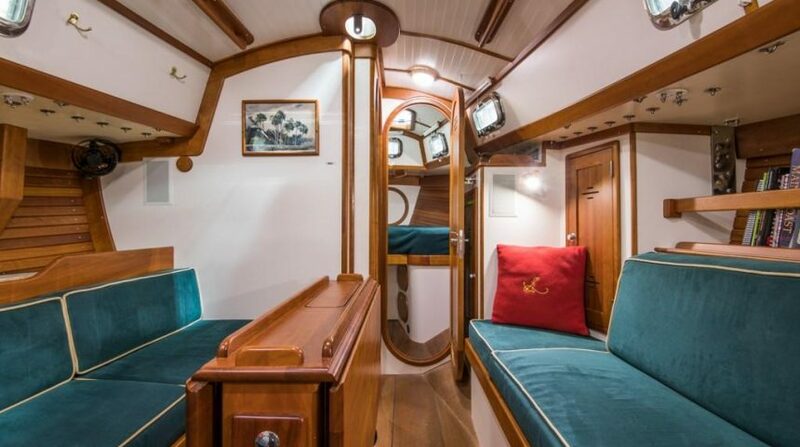 (2) in main cabin and (1) in quarter berth. 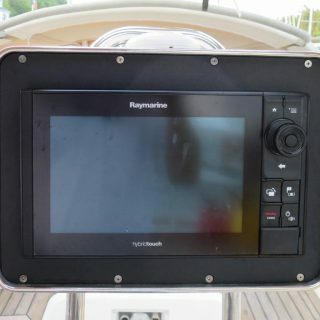 Raymarine Axiom Pro 9” Hybrid Touch color chartplotter/multifunction display at pedestal. 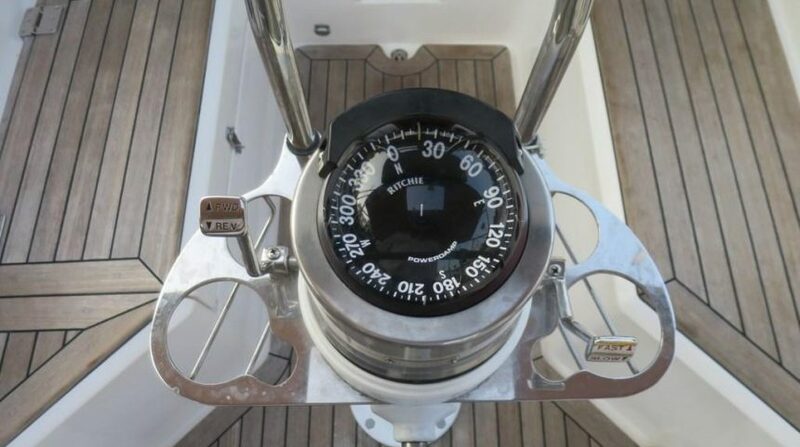 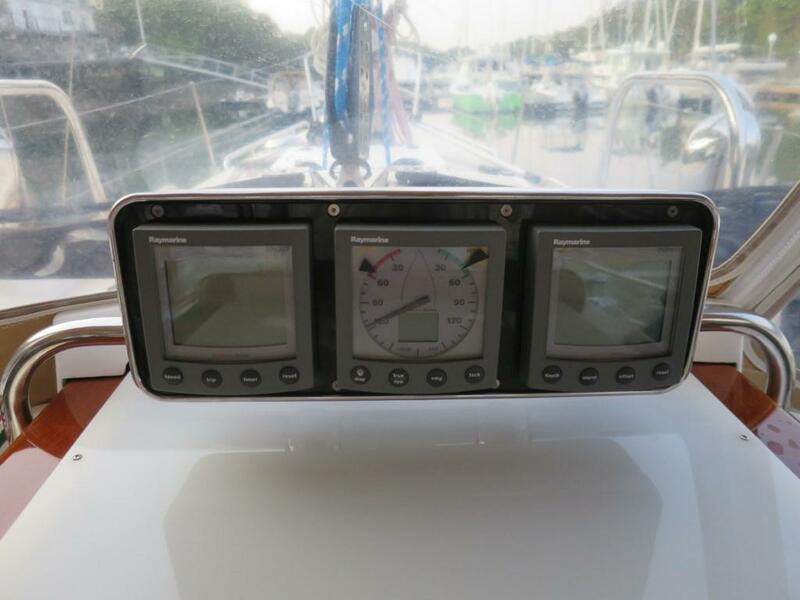 Raymarine ST60 wind/speed/depth instruments at nav station and on companionway bridge. 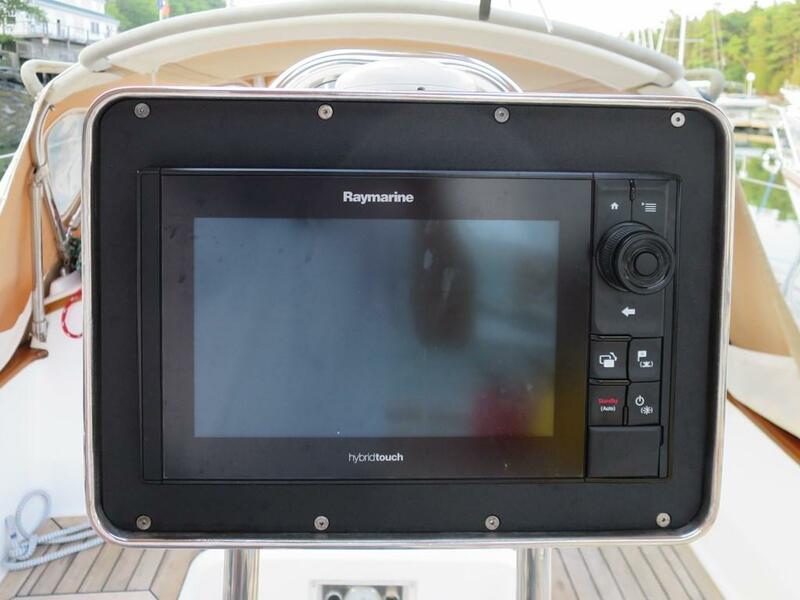 Raymarine Axiom Pro 9” Hybrid Touch chartplotter/multifunction display at nav station. 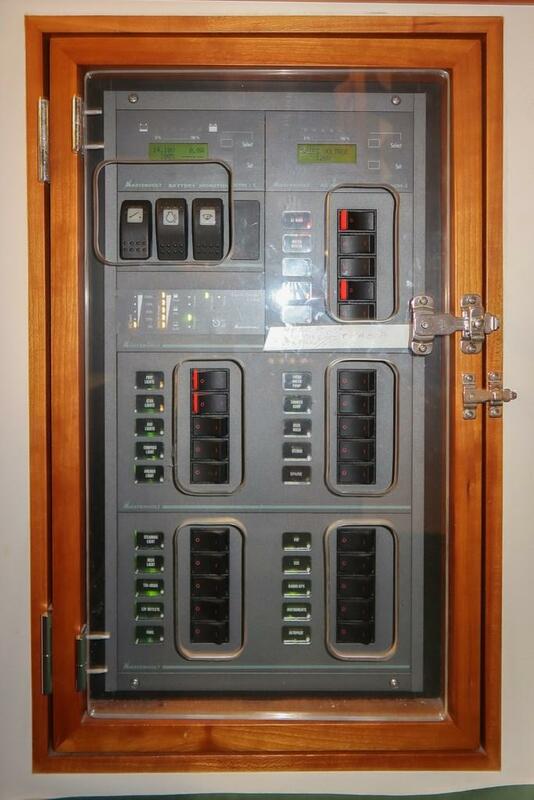 Icom M802 SSB radio at nev station with AT-140 tuner in lazarette. 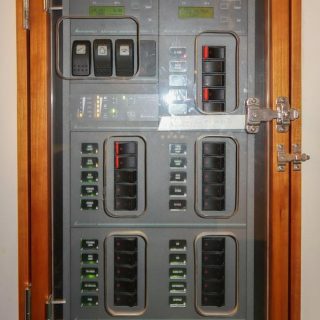 Motorola 9505 Iridium phone at nav station. 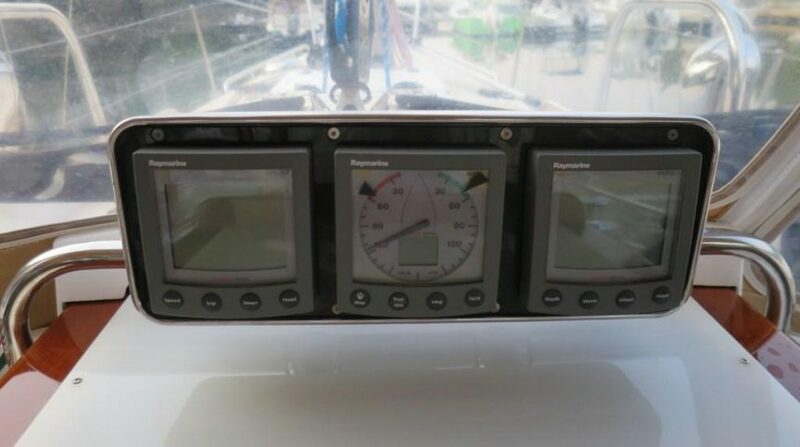 Raymarine ST6001 S3G autopilot with control heads mounted at cockpit and nav station. 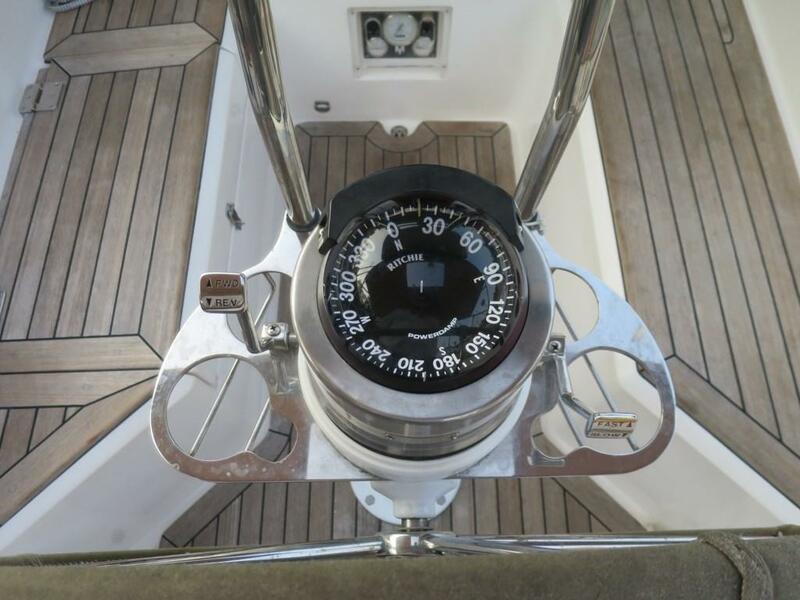 Double ended main sheet – main sheet runs to winch on cabin top in cockpit and to secondary winch next to helm for easy trimming sailing single or short handed. 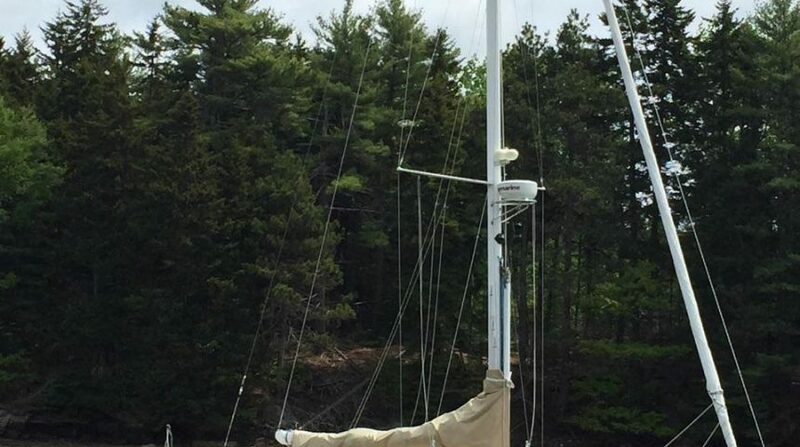 Rigging is in place for an asymmetrical spinnaker, including tack line and block, sheet and lead blocks, and spinnaker halyard. 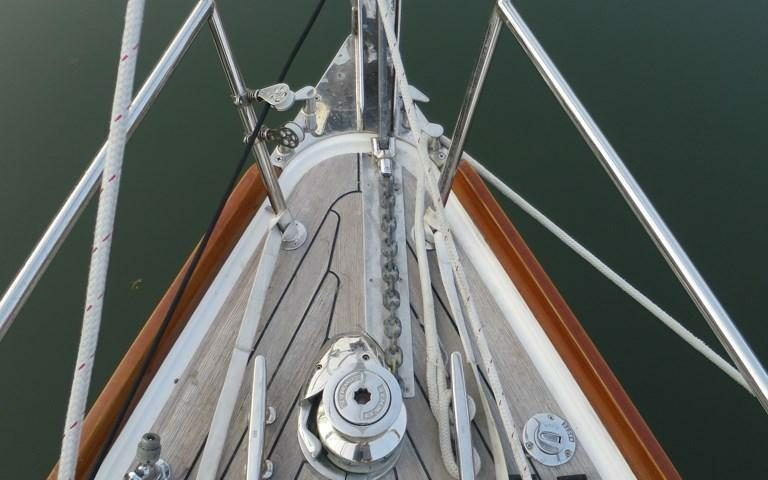 Fortress FX23 secondary anchor with 20ft of 5/16” SS chain and 120ft of ½” nylon. 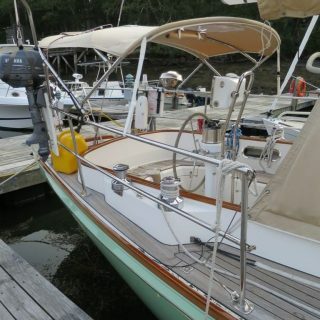 Edson outboard motor mount on stern rail with Novalift motor hoist. 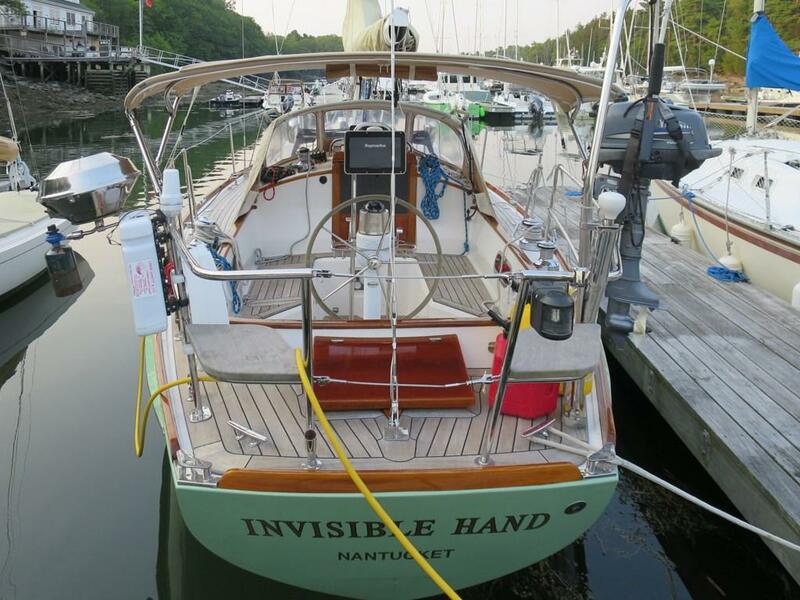 For more information on INVISIBLE HAND, or any other Morris listings, please contact Morris Yachts Sales & Brokerage Director Wythe Ingebritson at (207) 664-8111 or wingebritson@morrisyachts.com.